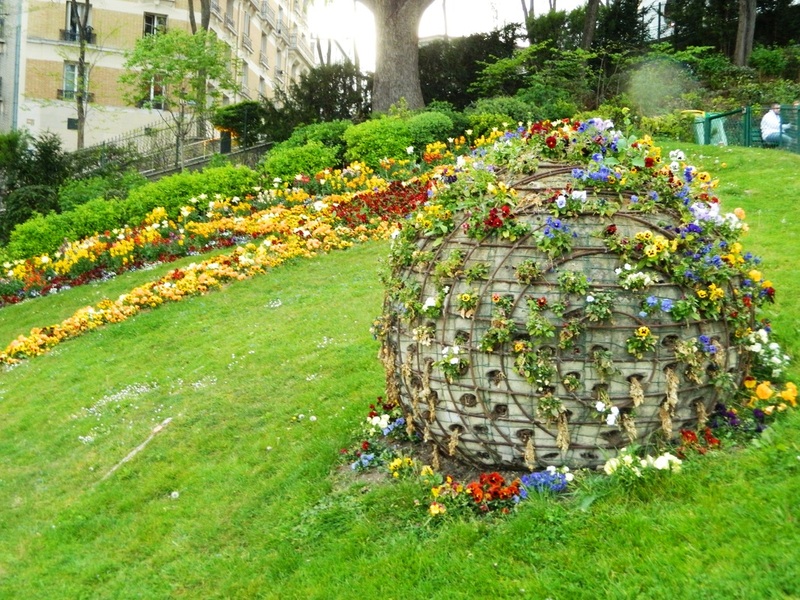 What a joy to experience Paris in the Springtime, or anytime at all! 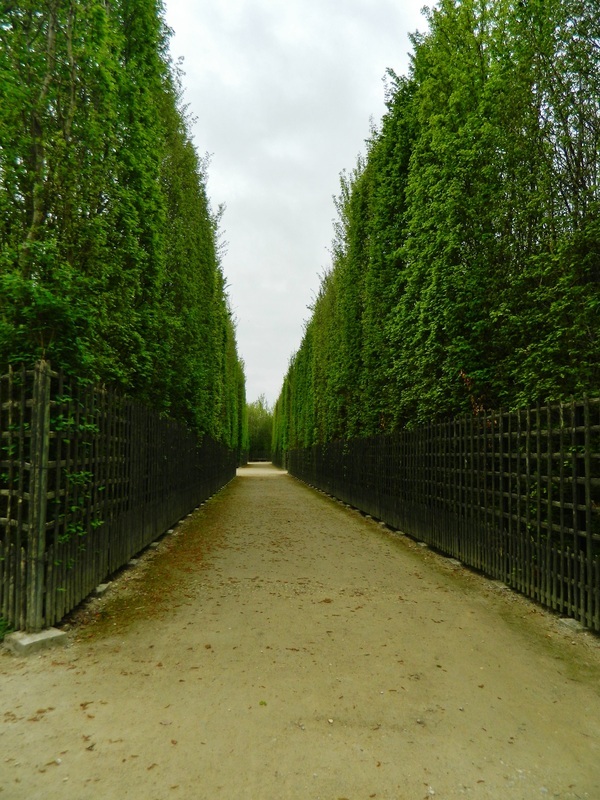 My family's recent Paris adventure covered (most of) the must-sees, and some unexpected surprises that were off the beaten path. 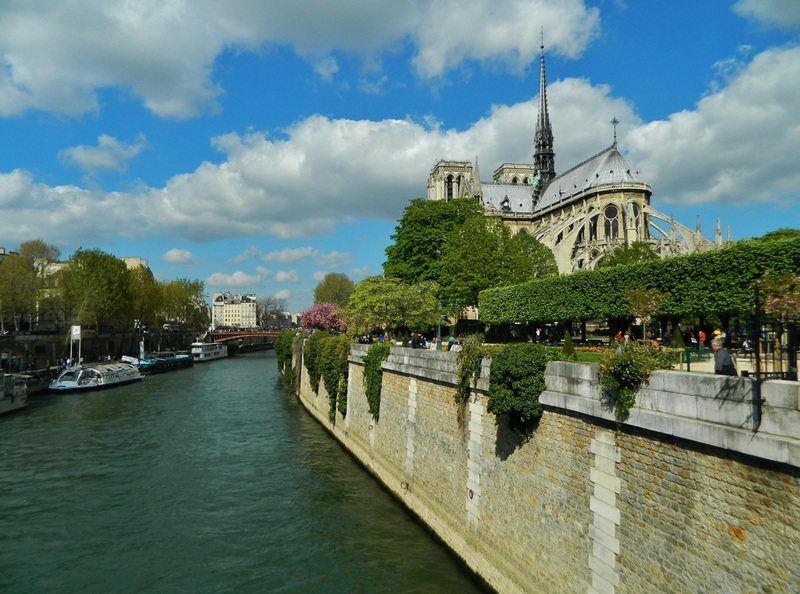 With so many museums, art exhibits, and cathedrals to cover, "seeing" Paris can feel like a big job if you don't take a step back, pull up a chair at a sidewalk cafe, and just watch the world go by for a few minutes! 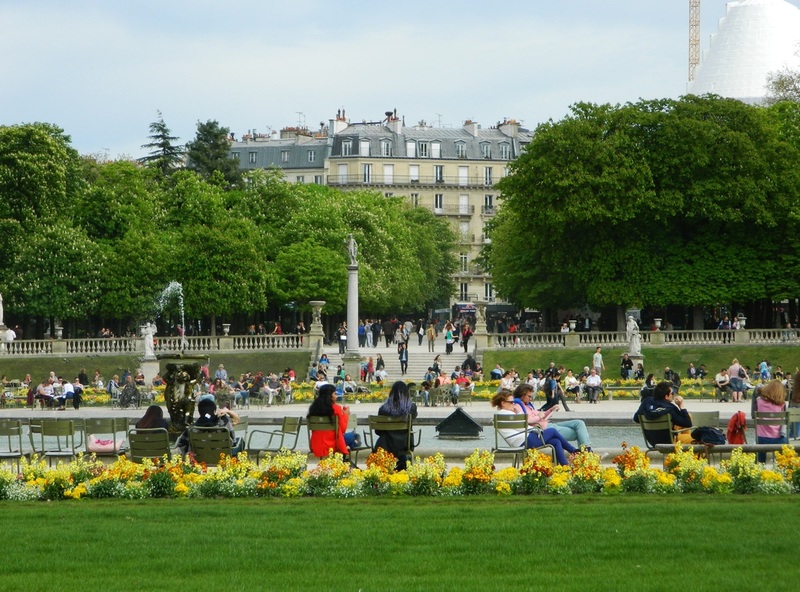 There is certainly no shortage of cafes, parks, and benches available for just this purpose, so if you are lucky enough to get to visit Paris, allow yourself some downtime just to take it all in. There is so much information about each place we visited that I have yet to learn, and still far too much information that I did learn to share here that this would be a book, and not a blog if I tried to include it all. So, this entry is mostly pictorial with a few nuggets of information thrown in... 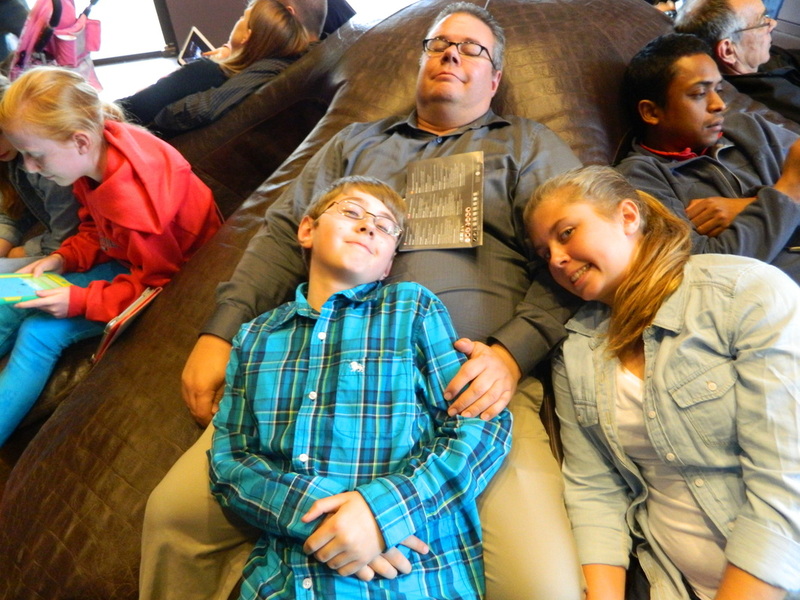 Check out my "Traveler's Notes" for some tidbits about family travel to Paris. 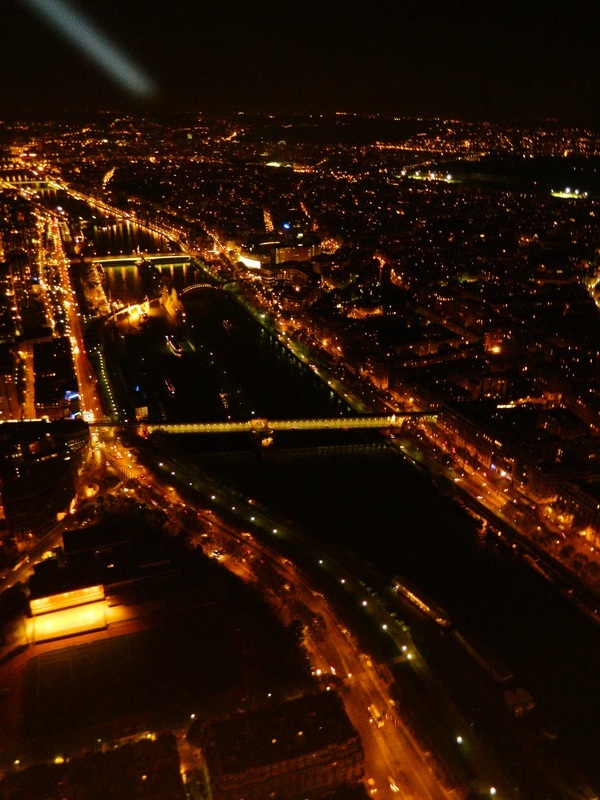 As is typical for us, our itinerary was aggressive, and jam-packed. Day one started at the Palace & Gardens of Versailles, and ended at the top of the Eiffel Tower with a visit to the Arc de Triomphe in between. The Palace from the back, leading to the gardens. 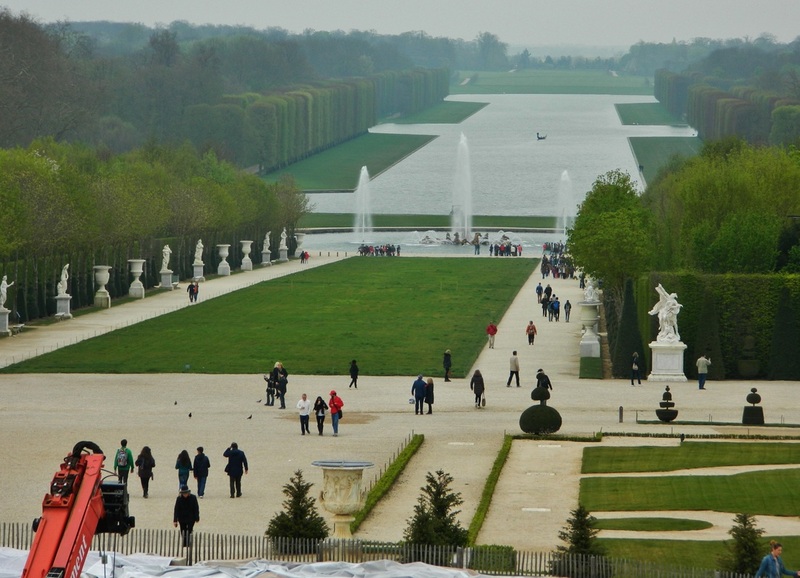 The gardens at the Palace of Versailles encompass 977 acres of land...in every direction there are grottoes, fountains, and paths which seem to go on forever. For people who want to see more in a short amount of time, you can rent a golf cart and zippity-zip around pretty quickly. 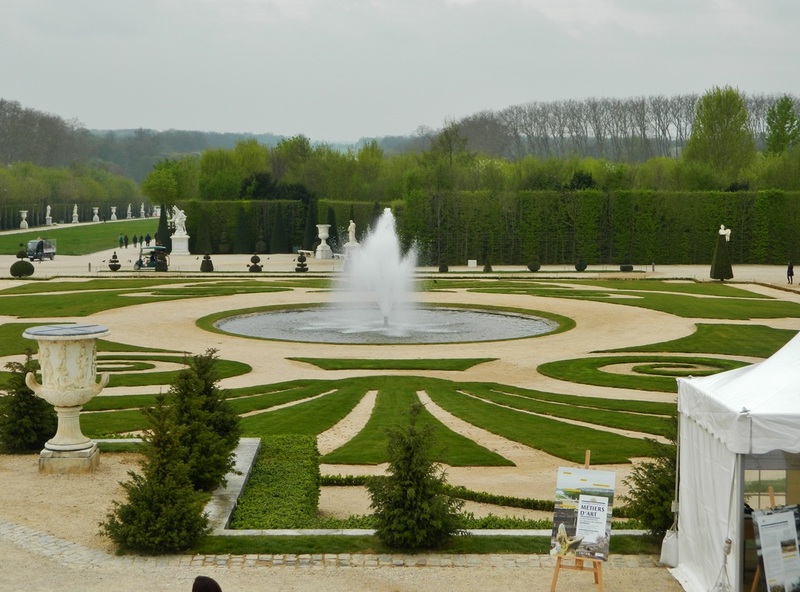 We walked, so we saw only a fraction of the immense gardens, but even in a golf cart, I suspect it could take several days. We noticed a lot of people out for their morning runs through the gardens, as they are open to the public without a ticket to the Palace. 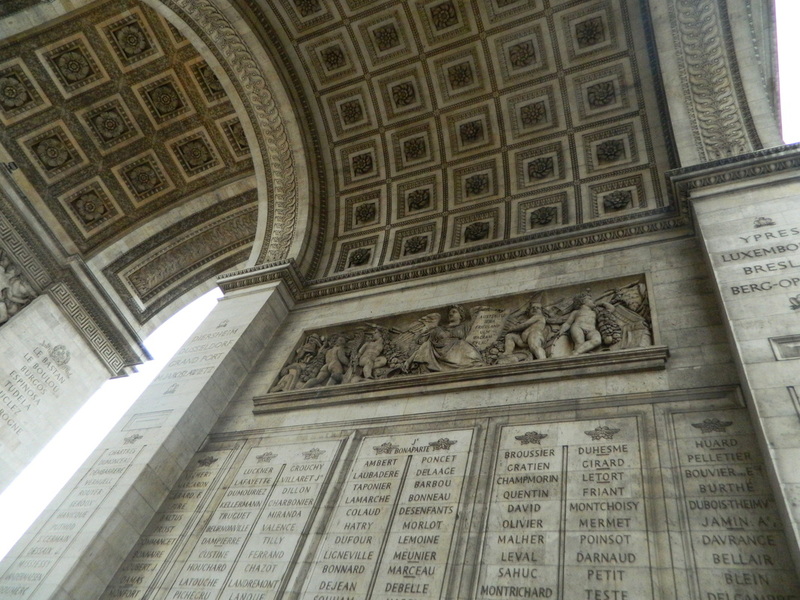 Situated in the center of Place Charles de Gaulle at the western end of Champs d'Elysee (the most famous street in Paris) the Arc de Triomphe is one of the most famous monuments in Paris. We opted to go up to the top for the view, even though we had a bit of a cloudy day. It's spiral stairs all the way up, but compared with some of the cupolas we've climbed, it really wasn't bad. I think the cost was around 20 euro for the four of us. 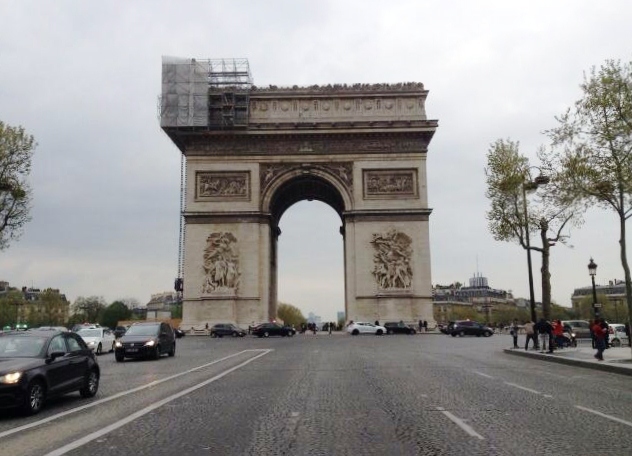 Arc de Triomphe viewed from the middle of the street! 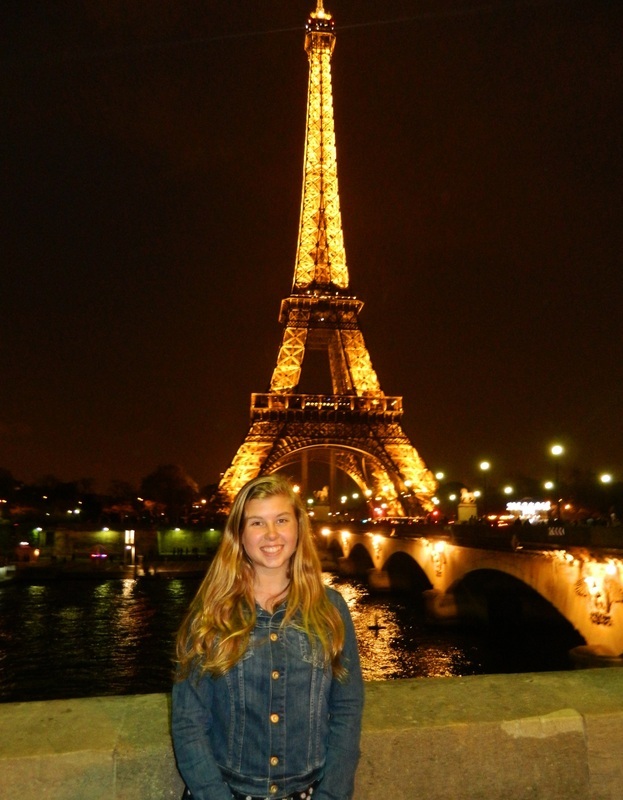 Visiting the Eiffel Tower is a must when you visit Paris! Plan ahead and buy and print your tickets online...if you've pre-paid you can skip the line, which is definitely a plus, but more than that, you are guaranteed a time slot to go to the top, despite what will most certainly be long lines. 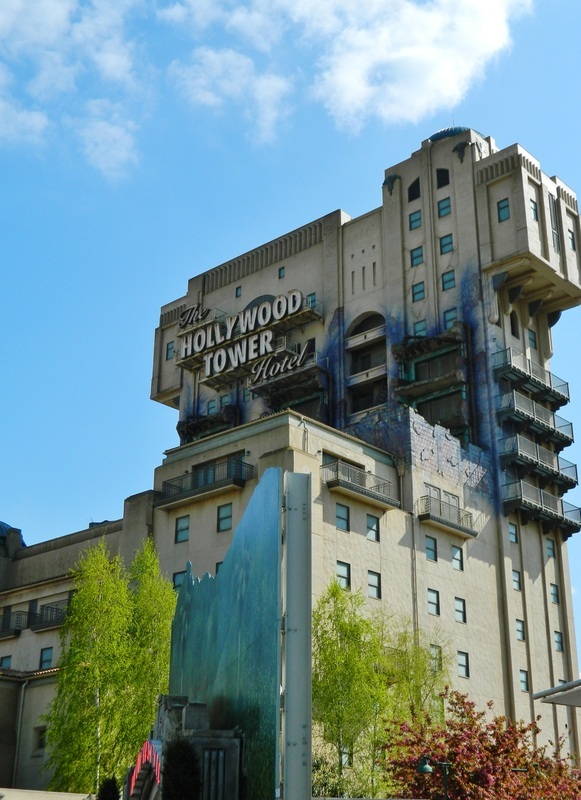 When we booked our tickets, out of 4 possible days when we were available to visit the Tower, there was ONE time slot available for a ride to the top. Lucky for us, the one time slot that was available happened to be at night! We visited the tower during daylight as well. 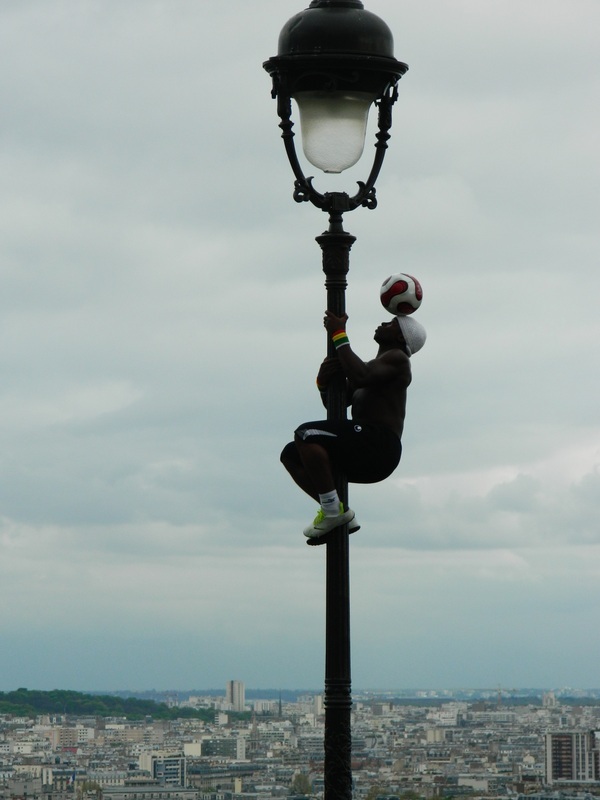 There is a little park area just over the river across a bridge that offers some great views and photo ops. 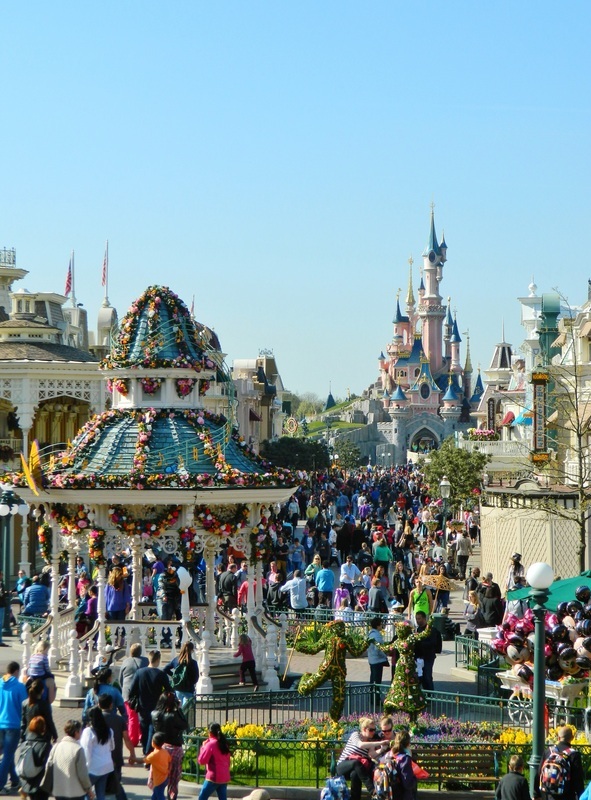 As with any major attraction, keep your valuables close and be prepared to be under siege by vendors selling every souvenir known to man. 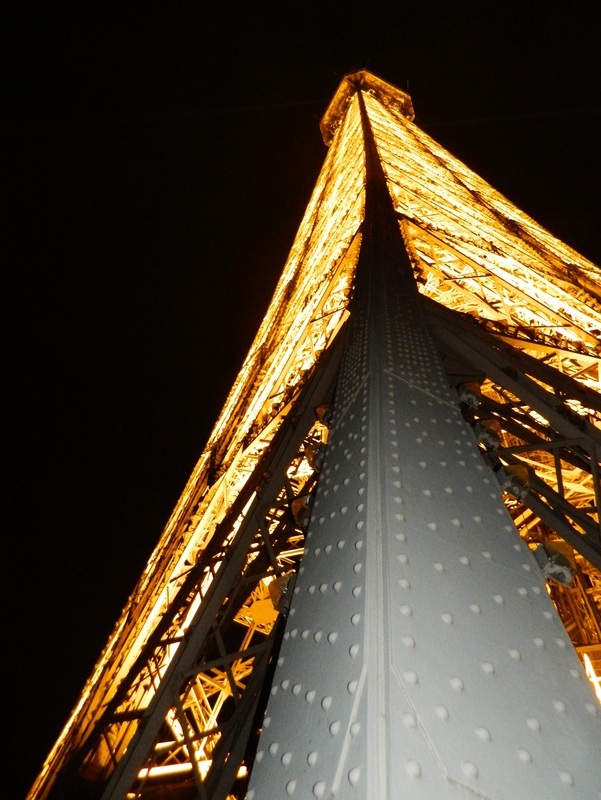 Buy Eiffel Tower Tickets Here! 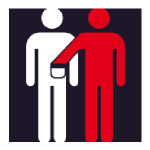 This is the pickpocket warning sign you will see all around at the Eiffel Tower! 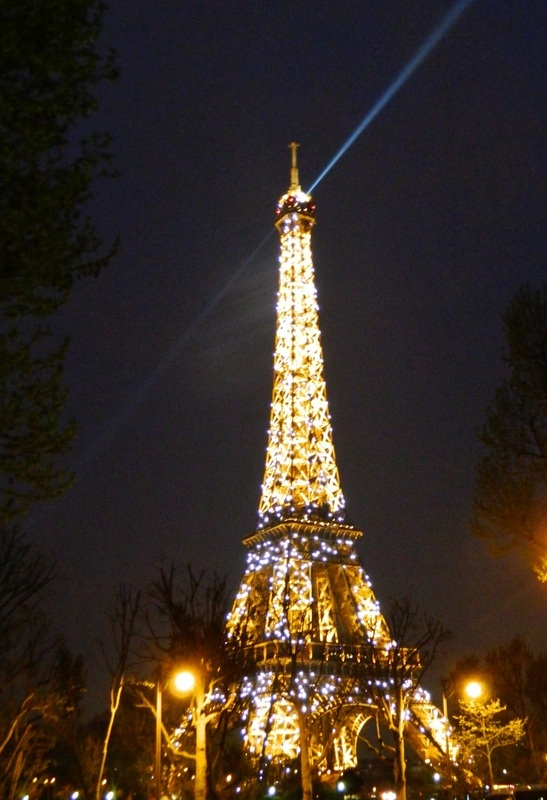 My favorite part about the Eiffel Tower at night is that for the first five minutes of every hour from 8PM until 1AM, the Tower is not only lit up, but it also sparkles! 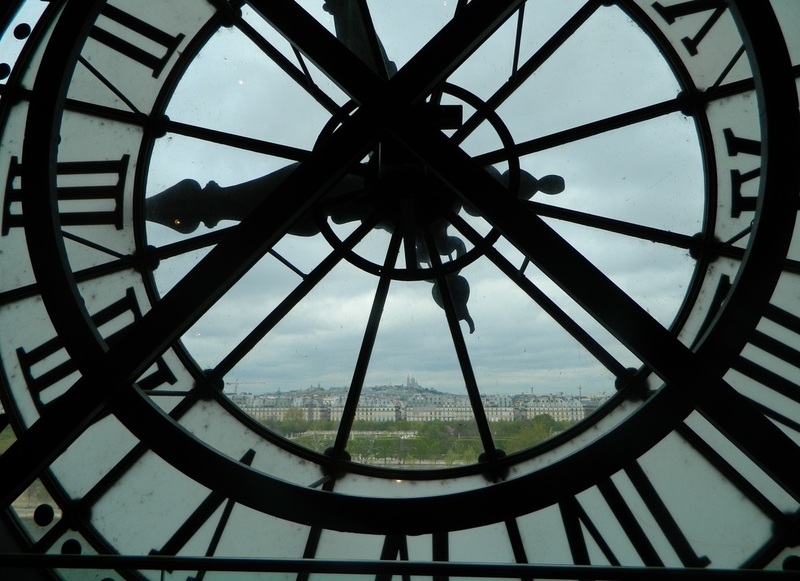 Be prepared to be patient and wait in long lines to get to the top of the Eiffel Tower...even though your pre-purchased tickets get you through the lines on the ground floor, once you're in, you have to que up to keep going up. 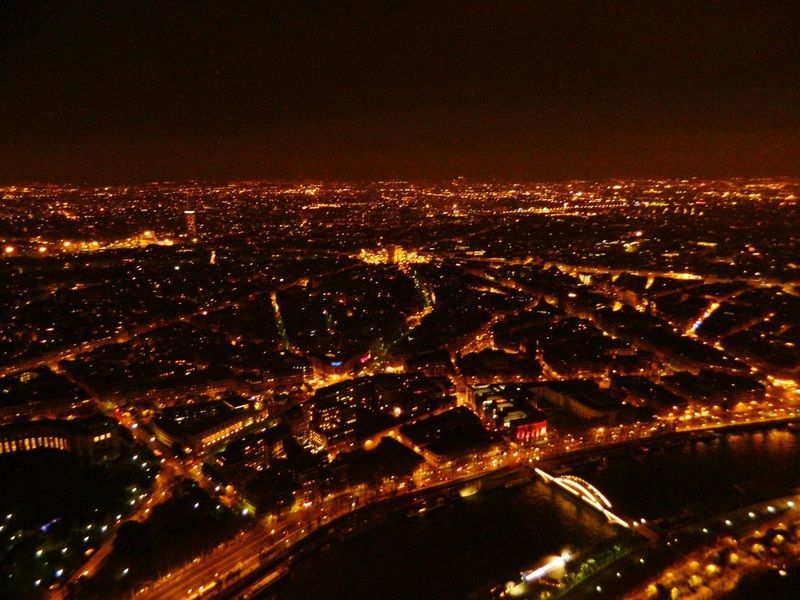 The Eiffel Tower is 1, 063 feet tall, just a couple hundred feet shy of the Empire State Building. To put it in perspective, the Statue of Liberty is only 305 ft. tall. Bring a jacket...it's COLD up there! 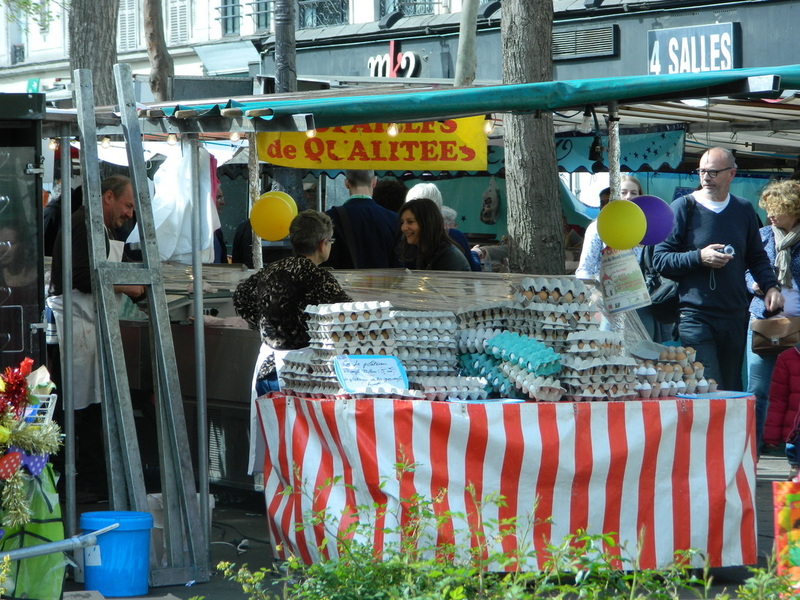 Day two began with a delicious breakfast of omelettes and crepes and a stroll down a charming street on the way to Notre Dame and the Île de la Cité. 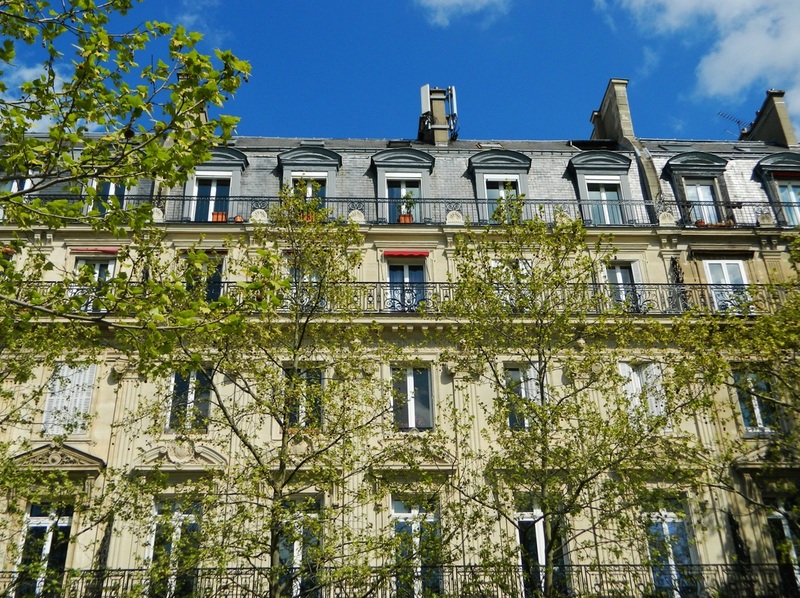 Typical charming apartment building...very French! 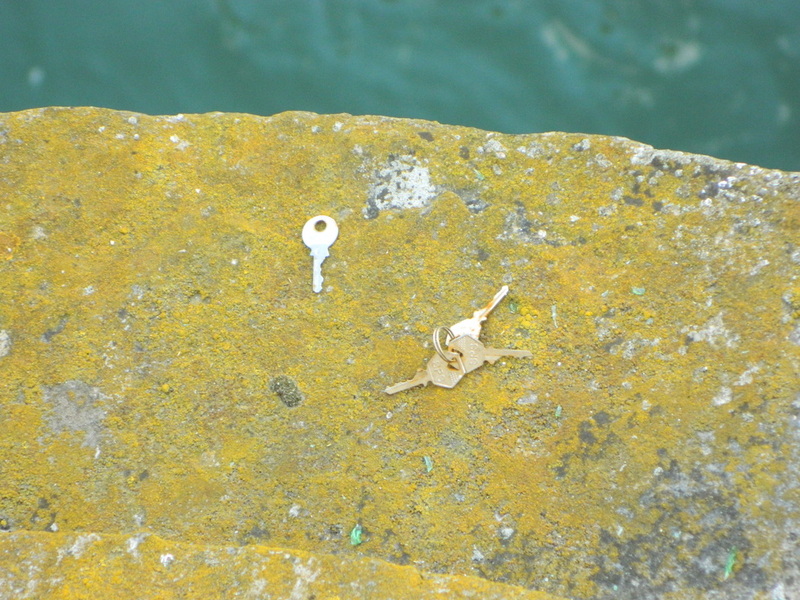 Uh-oh...someone's keys didn't make it into the river..
A love lock couple, perhaps? 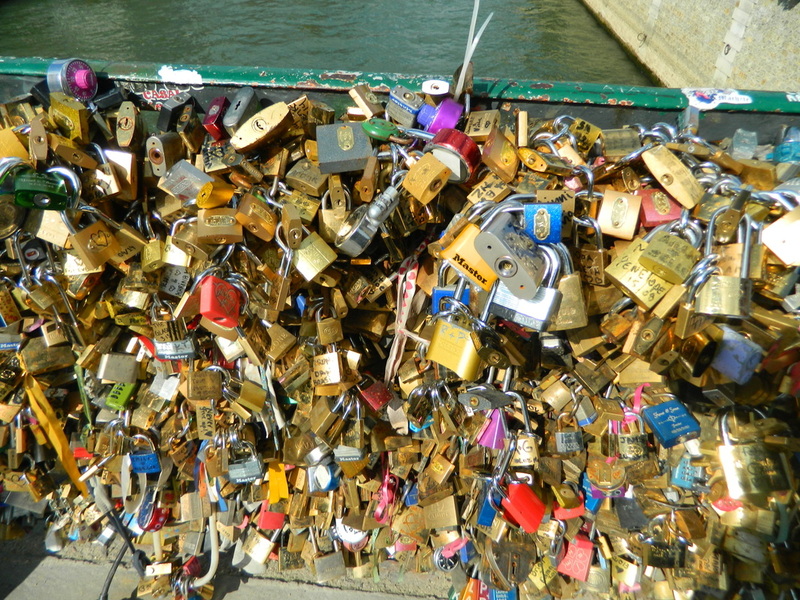 Paris IS the City of Love and scenes like this are not uncommon! 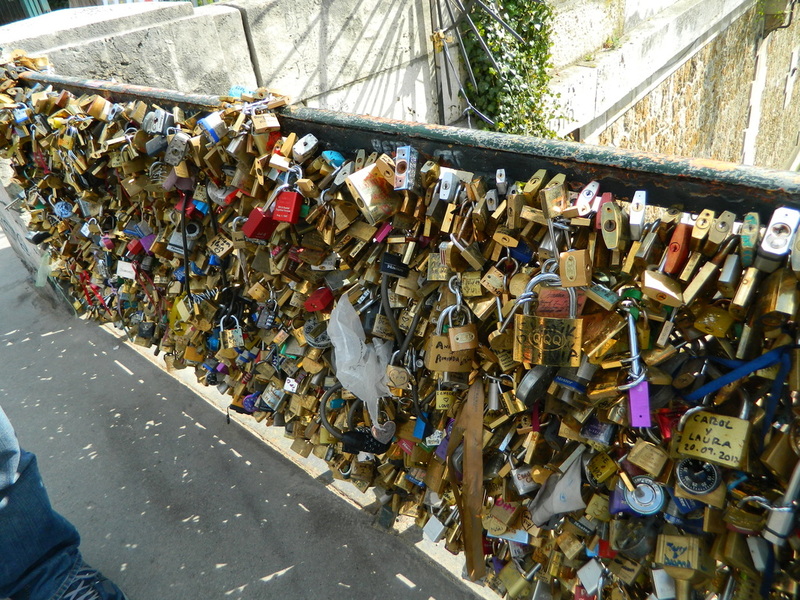 Vive l'amour! Notre Dame on the Île de la Cité. Beautiful! 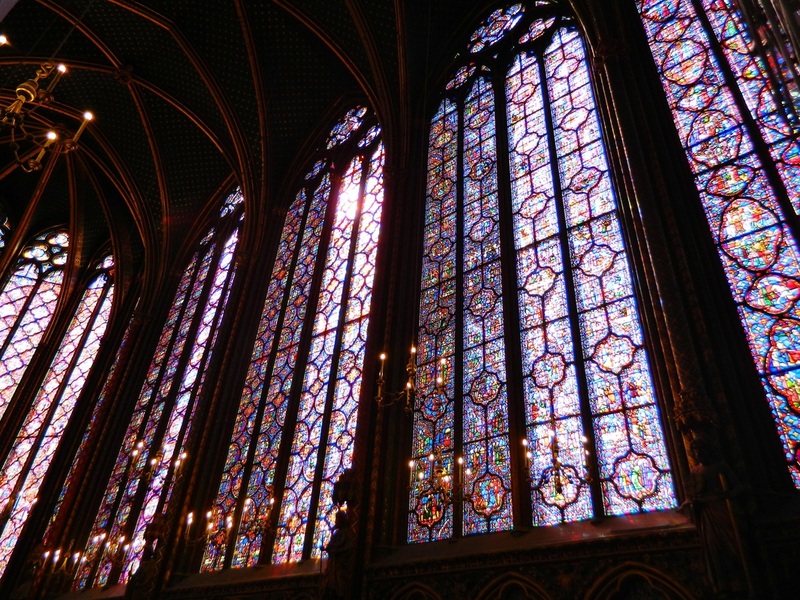 Completed in only five years, Sainte-Chapelle has some of the most magnificent stained glass windows in the world, depicting the entire history of Christianity from Genesis to the crucifixion of Jesus. 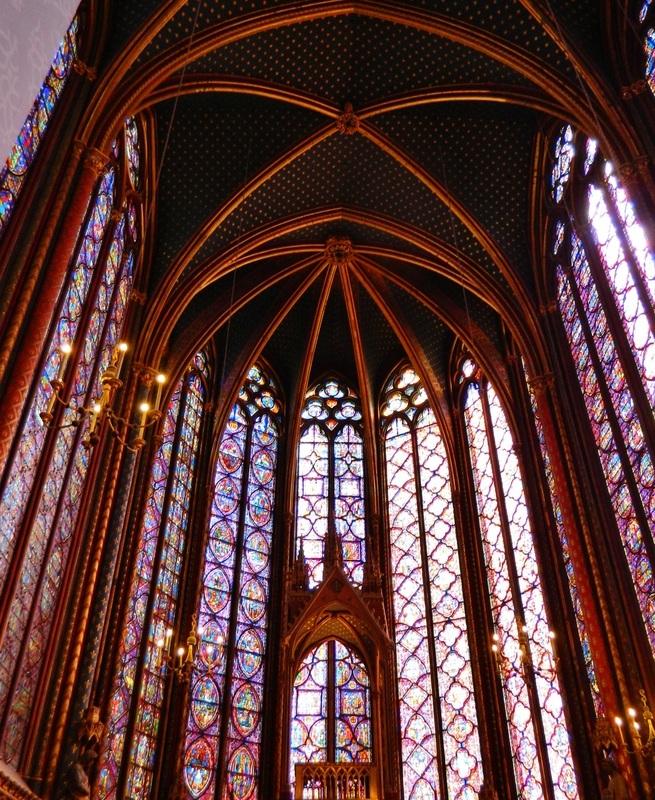 This "Holy Chapel" was built under the direction of King Louis IX of France, who constructed it as a chapel for the nearby royal palace, Palais de la Cité. 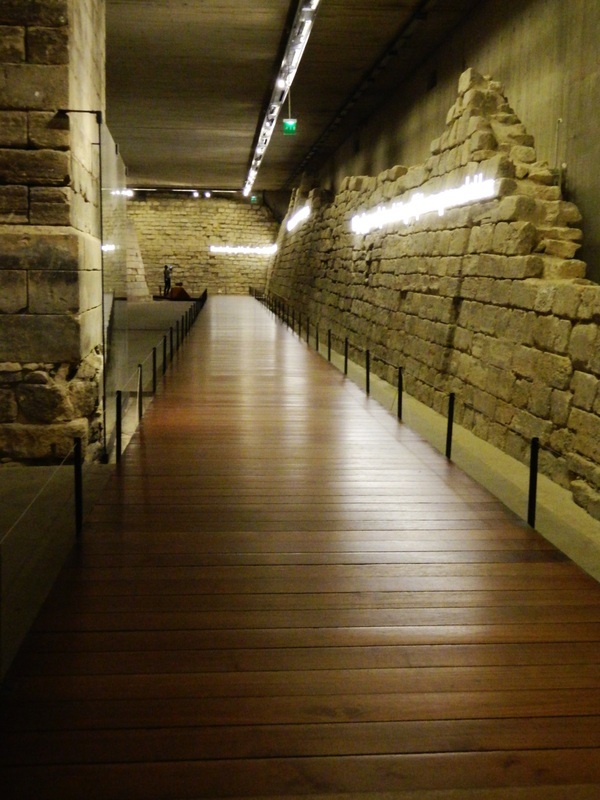 Over the years, the Palais de la Cité was also used as a prison, and today is called la Conciergerie. 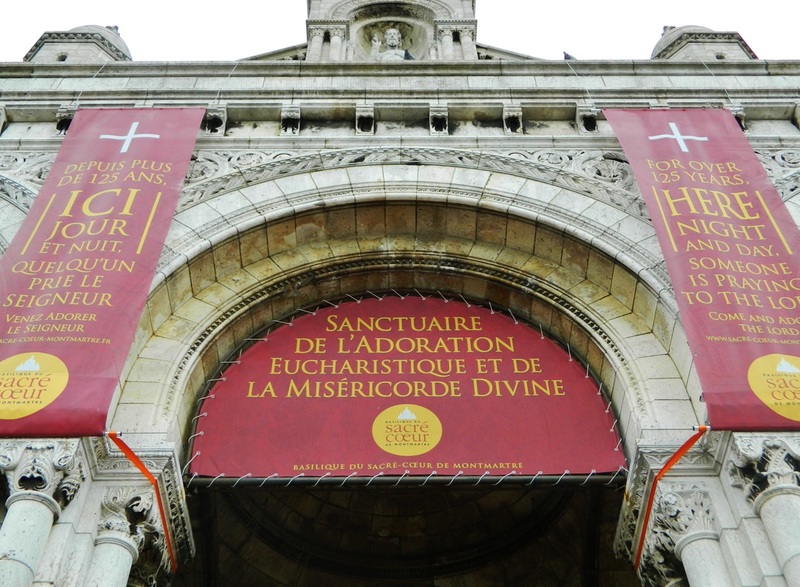 It is part of the larger Palais de Justice which now almost completely surrounds Sainte Chappelle. 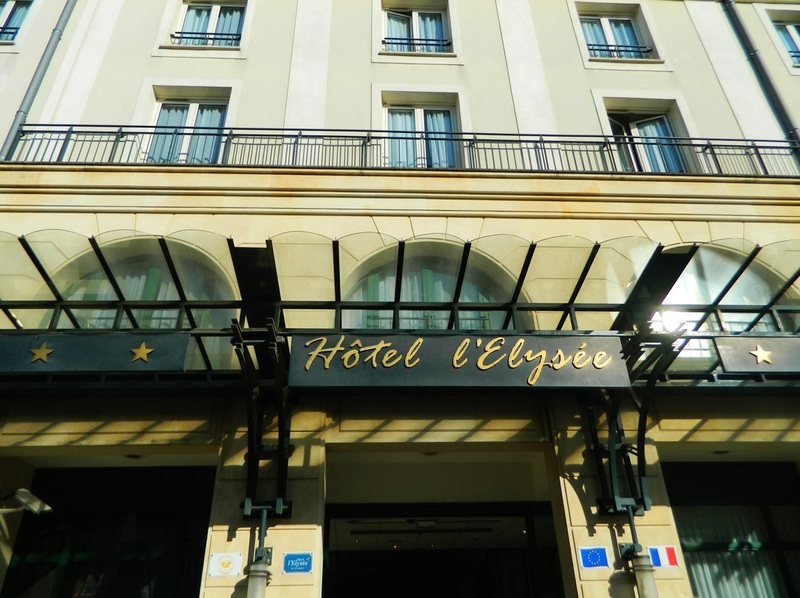 From Sainte Chappelle, it's a short walk to the Louvre Museum, one of the world's largest art museums, and former palace. 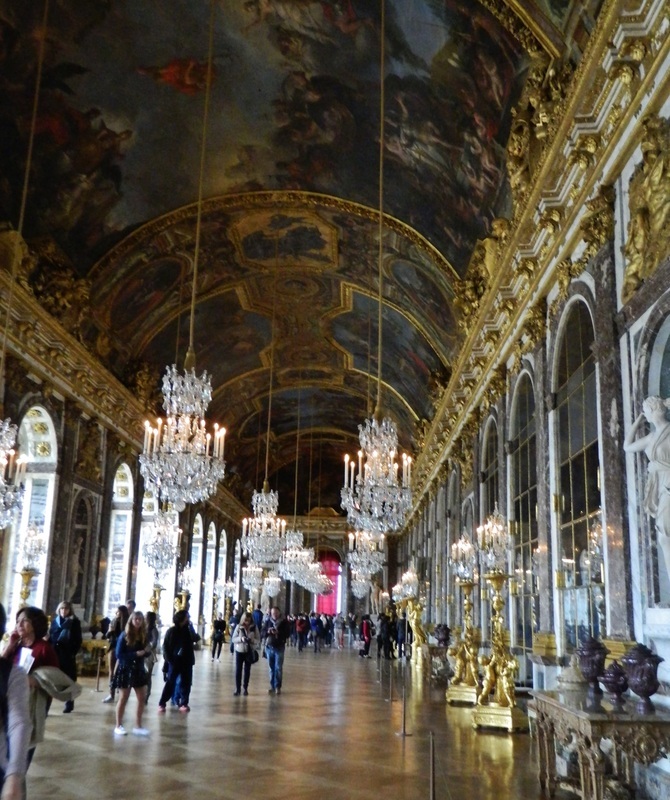 This was where the King of France lived, up until Louis XIV became King and decided to "add-on" to Versailles and move in there permanently. 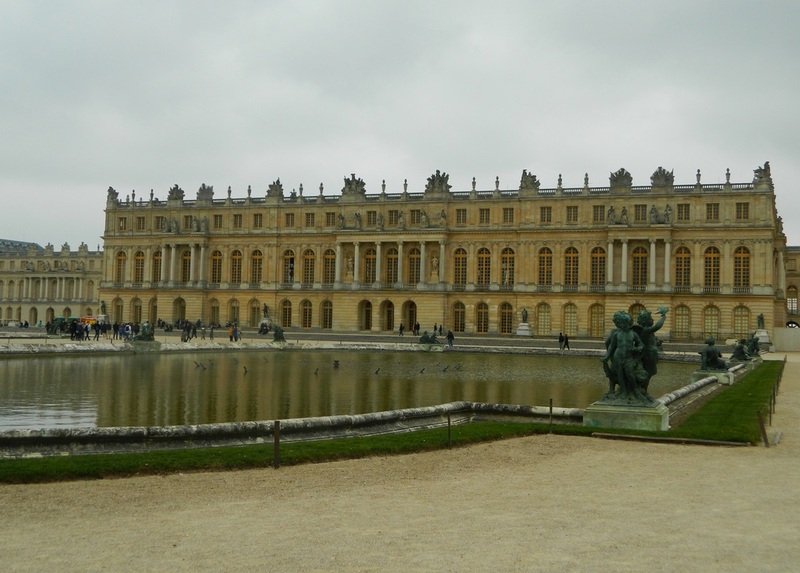 What is now the Palace of Versailles used to be a much more modest hunting lodge where royalty would go to get away from it all. 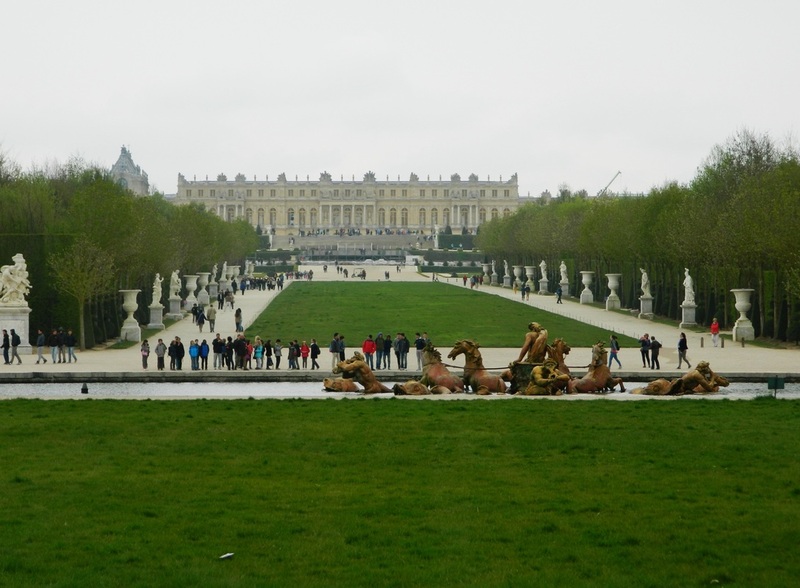 But, Louis XIV had grand plans for the place and turned it into what we see today. 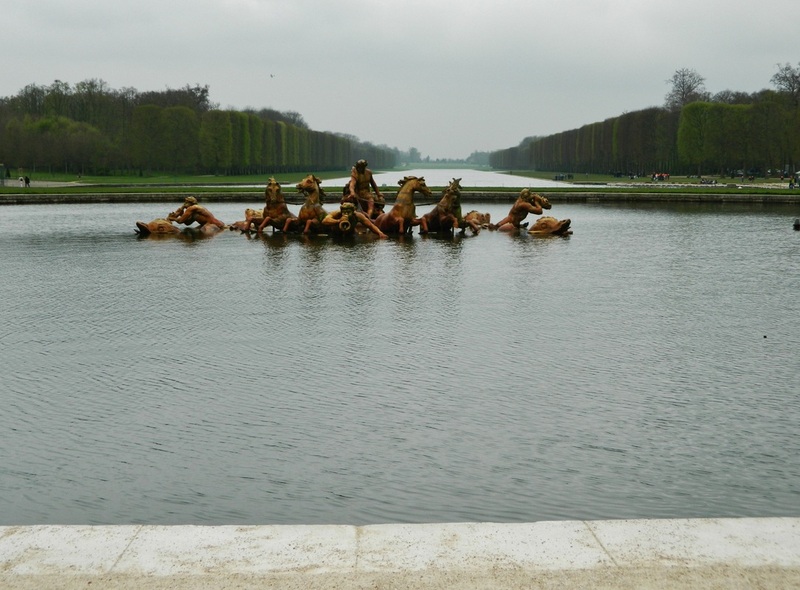 The move to Versailles left the Louvre available basically as a place to display the royal collection of art which included many Greek and Roman statues. 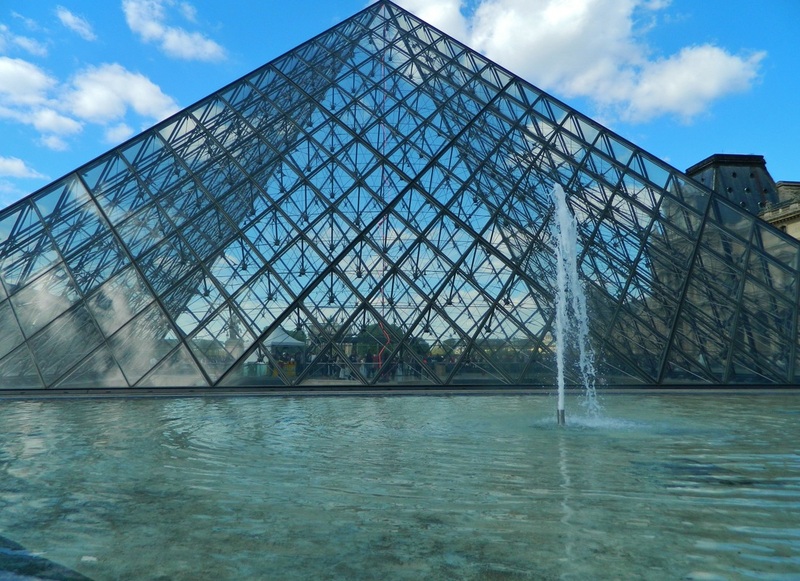 During the late 1600's, the Louvre was home to a painting and sculpture academy, and held the first of several art exhibits (Paris Salon). 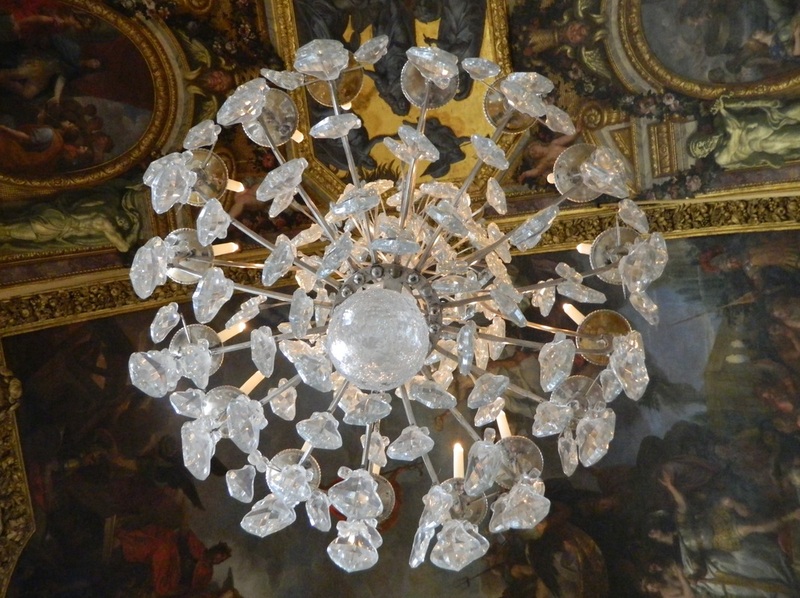 The Louvre was an art school for about 100 years before it opened as an art museum in 1793. 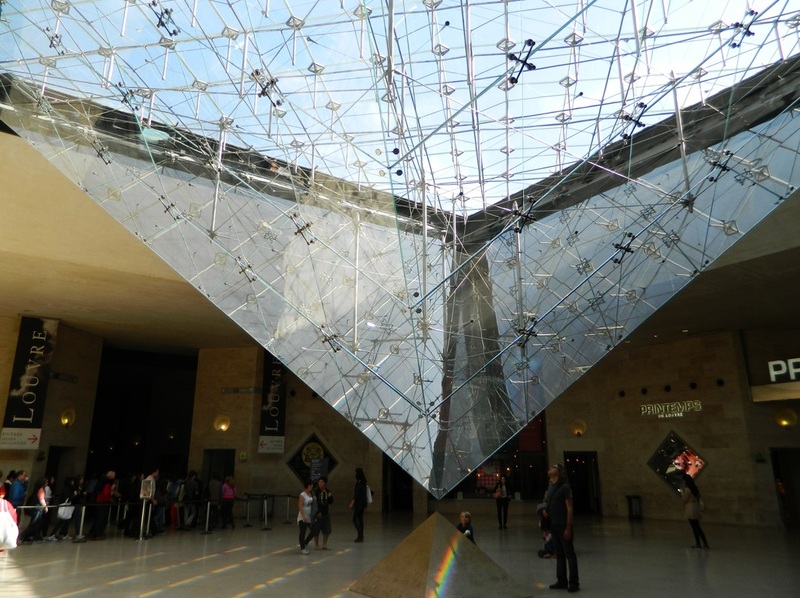 One of the famous paintings housed in the Louvre is the Mona Lisa. This painting is behind glass. Hence, the glare. 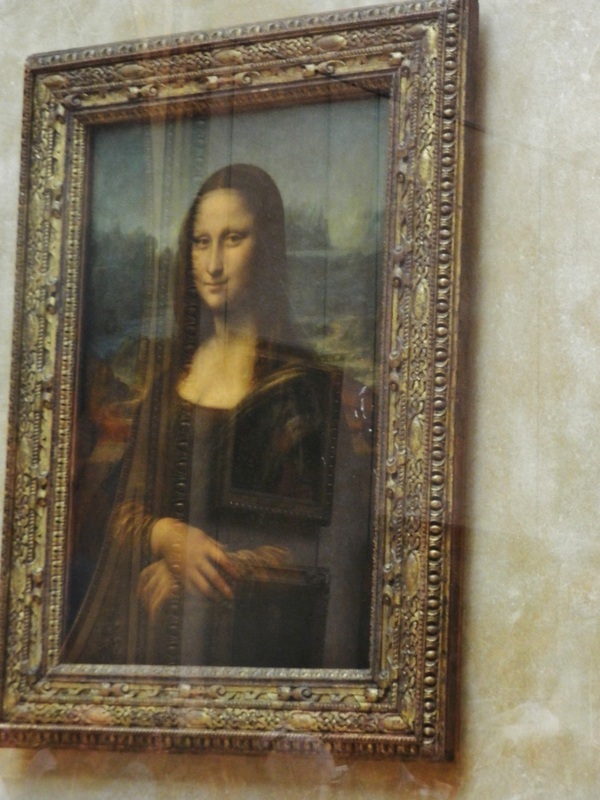 This is how small the Mona Lisa really is (see it way over there in the back?). 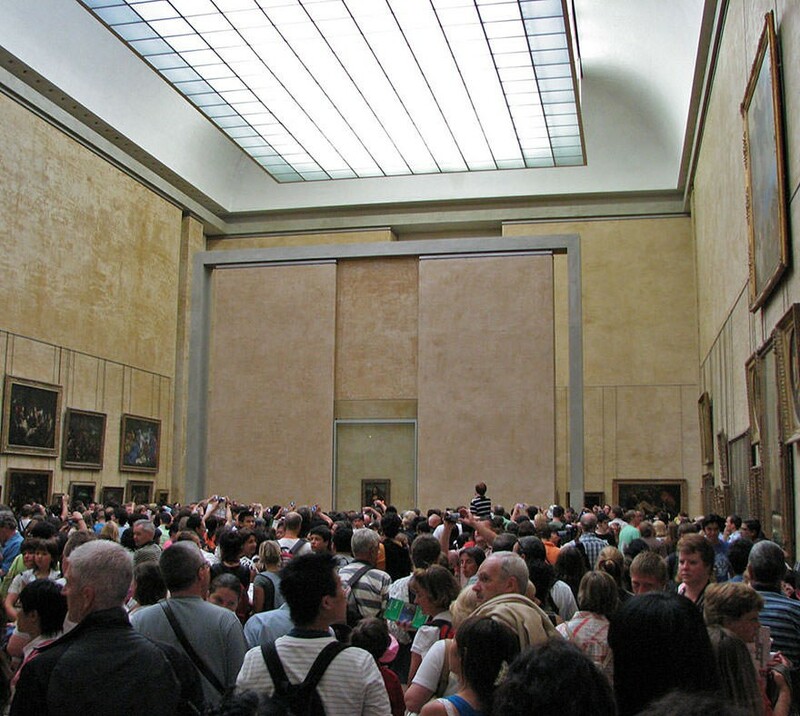 Luckily it wasn't quite this crowded when we were there, and I didn't take this picture (photo credit: traveljapanblog.com), but it provides great perspective on the size and scope of the actual painting. 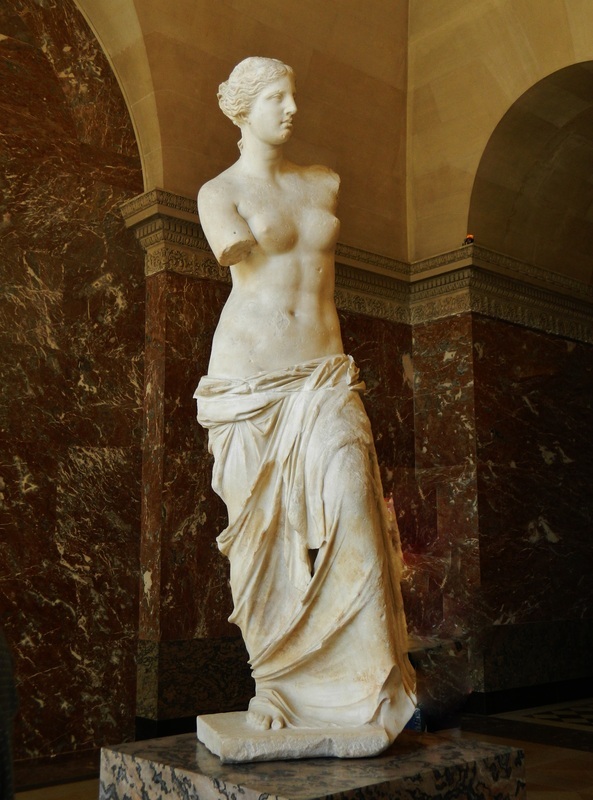 Aphrodite, known as the Venus de Milo, is also on display at the Louvre. This statue dates back to the late 2nd century BC. I think she has pretty good abs! 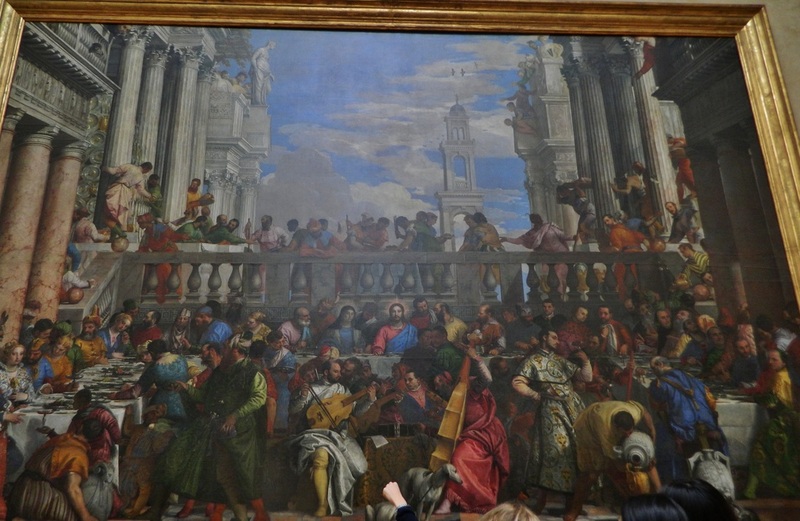 The Wedding at Cana (Paolo Veronese) is the largest painting on display at the Louvre. Hard to get the perspective on it from this photo, and impossible to capture the incredible detail. From small wrinkles or ornate patterns in the people's clothing to the subtlety of the expressions on the peoples faces, this painting is ahhhhmazing. 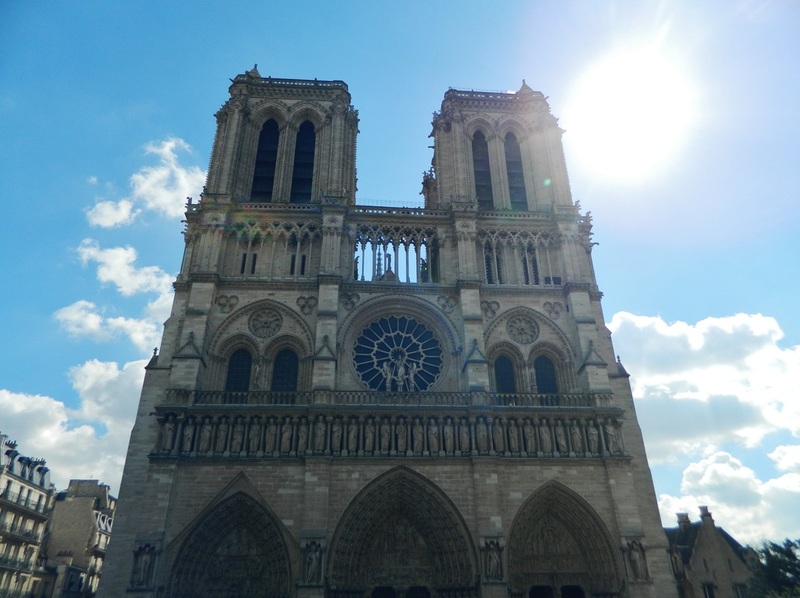 Our third day in Paris turned out to be wonderfully surprising...we had planned a trip to the Catacombs, but scrapped it due to sheer exhaustion... it turned out to be a good "non-plan." 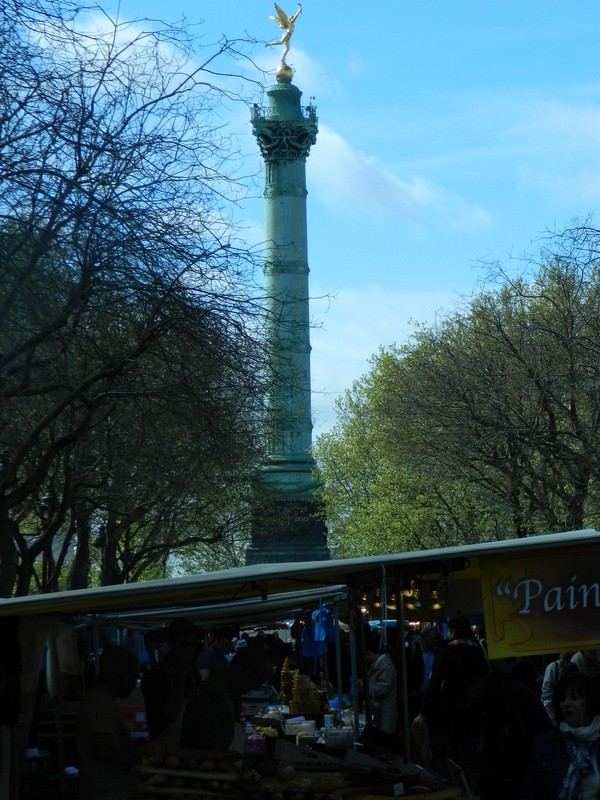 Instead we hopped the Metro to the Place de la Bastille (former site of the Bastille prison) where today the prison is gone and only a monument remains....What else remains is an amazing Sunday Market!! Row upon row of vendors selling every kind of food imaginable, fresh flowers, fruits and veggies, cheeses, meats, clothing...it is heaven in a 2 block square. Live music from a small trio (recently showcased on CNN International for their role at the market) and the smells of crepes, sausage, and fresh bread permeated the air. Locals shopped and ate and we shopped and ate right along with them! 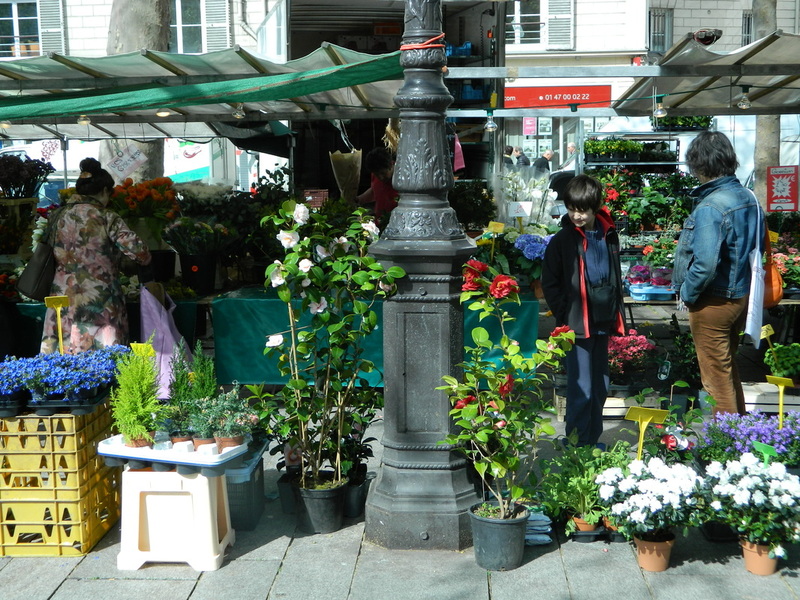 I have a soft spot for outdoor markets, so this may have been my favorite part of the trip. 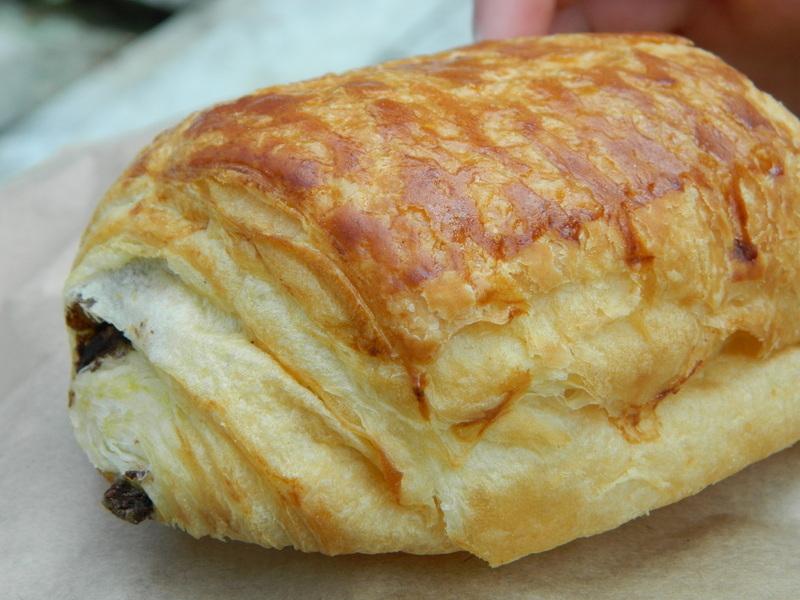 Croissant filled with chocolate. 'Nuf said. 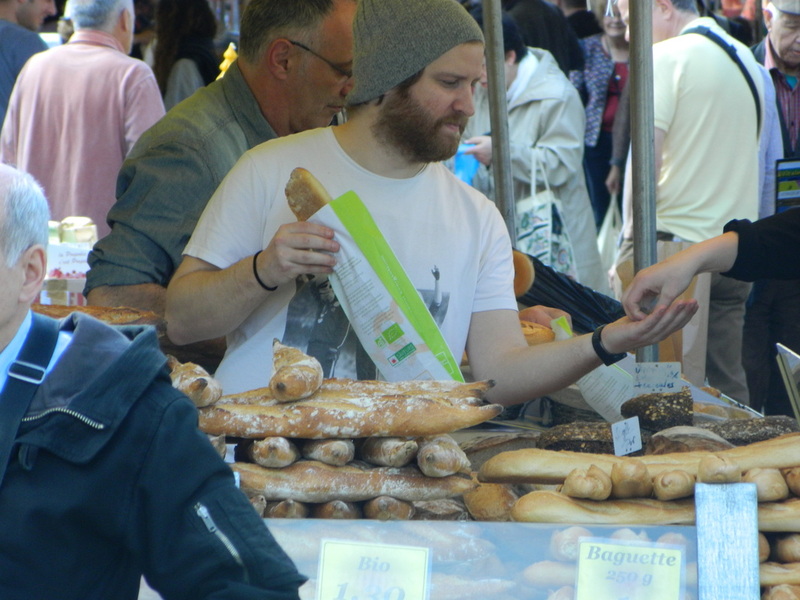 The bread guy. Oh, and beignets, too. Beignets are like what we would call a jelly-filled doughnut. Except lighter like they're made by angels out of clouds and fluff and air. Soooo good. 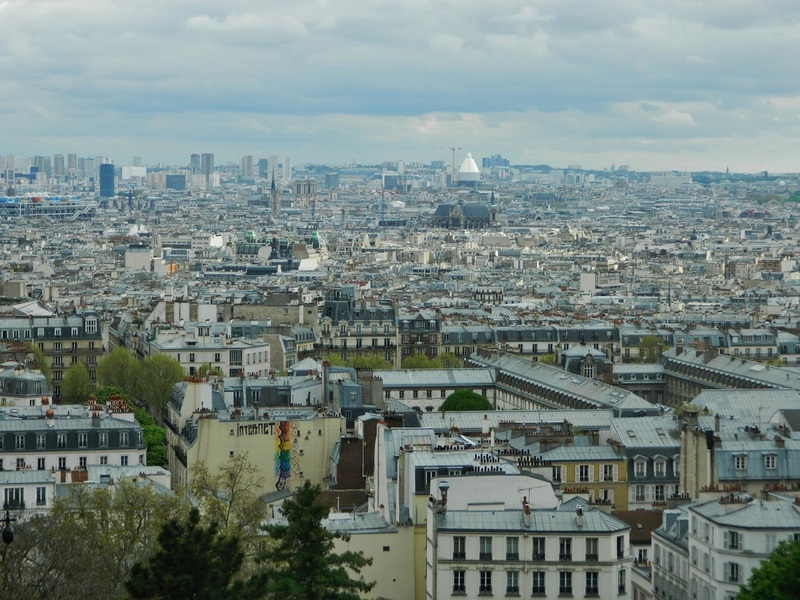 Bastille monument in the background. 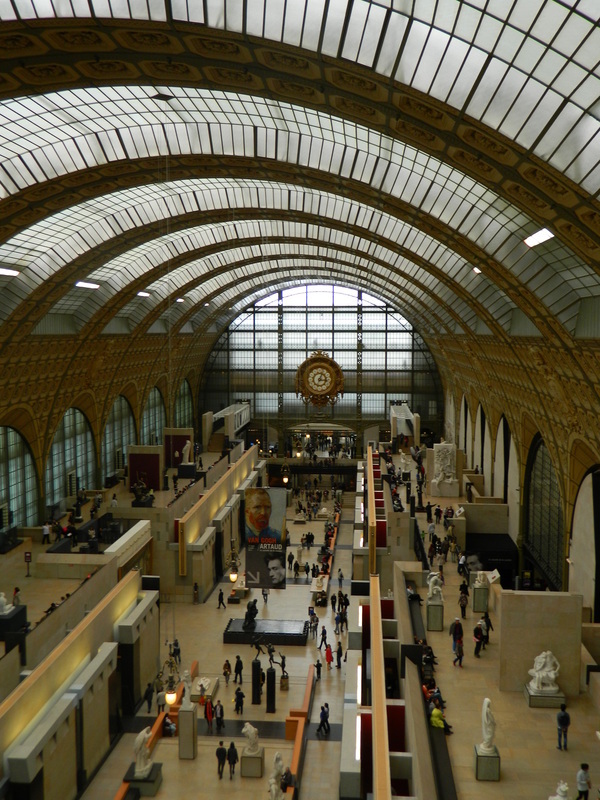 From the Bastille, we headed for yet another museum, the Musee d'Orsay. 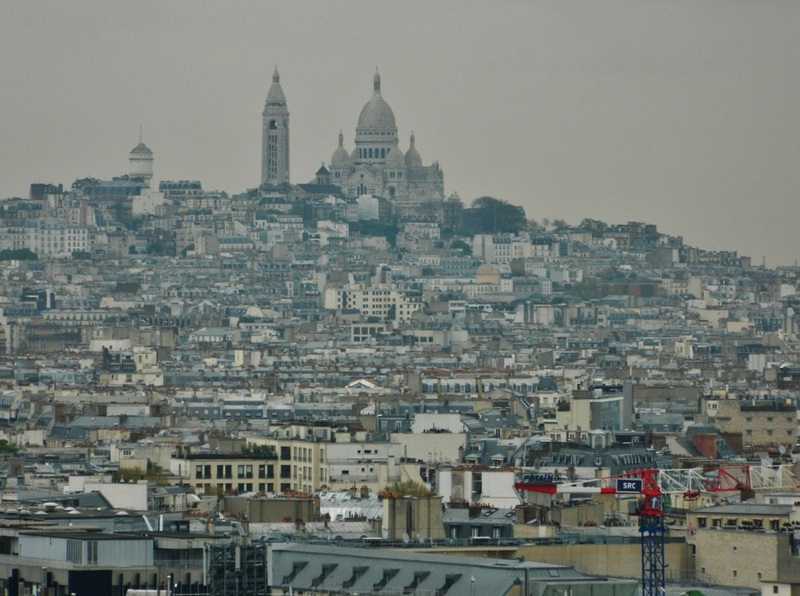 Montmartre is a hill in the north of Paris where many famous artists including Van Gogh, Monet, Dali, and Picasso had their studios. 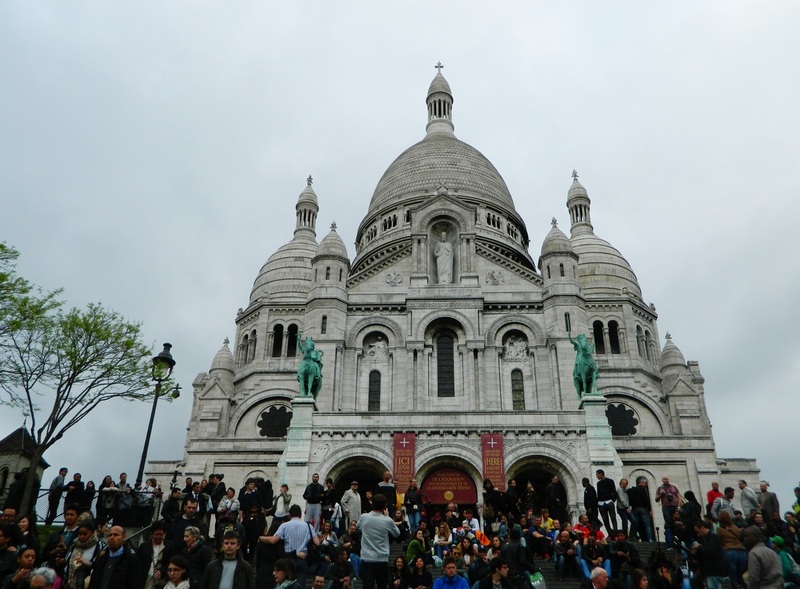 The area is most commonly known for the Basilica of the Sacred Heart (Sacre Coeur) at the summit of the hill, and albeit in stark contrast, for being a big nightclub district. From the bottom of the hill, you can ride a funicular railway to the top for the price of one metro ticket. 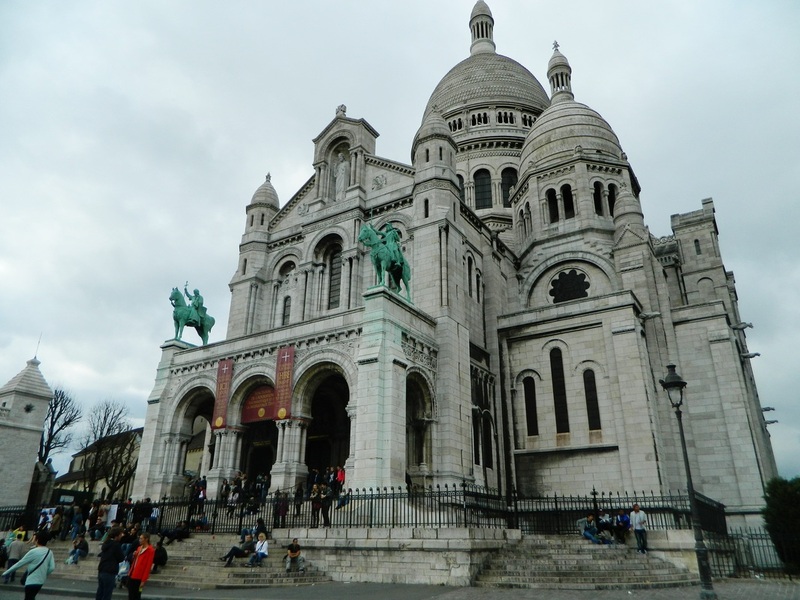 Otherwise you can take the stairs (300 of them)up the hill to the basilica. Crowded steps out front...great place to admire the view of the city! 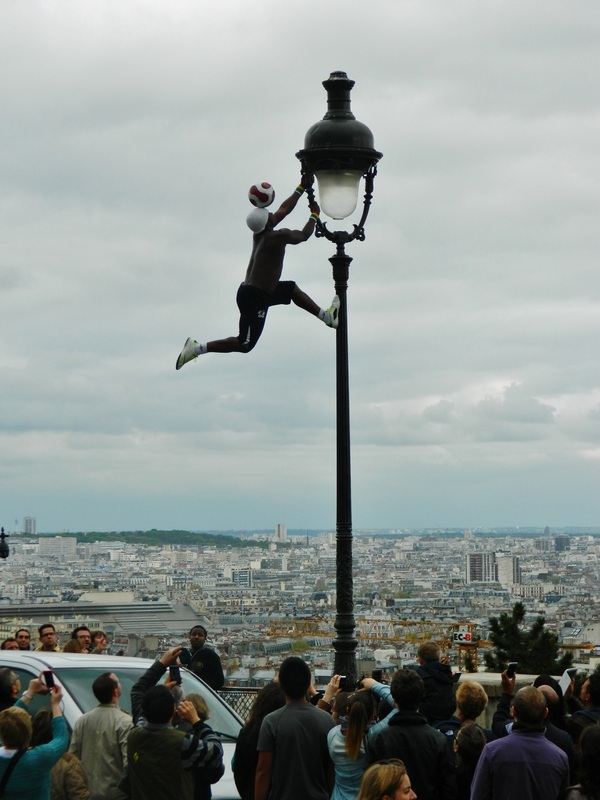 ...climbing a streetlight pole and he never dropped it once. Amazing! 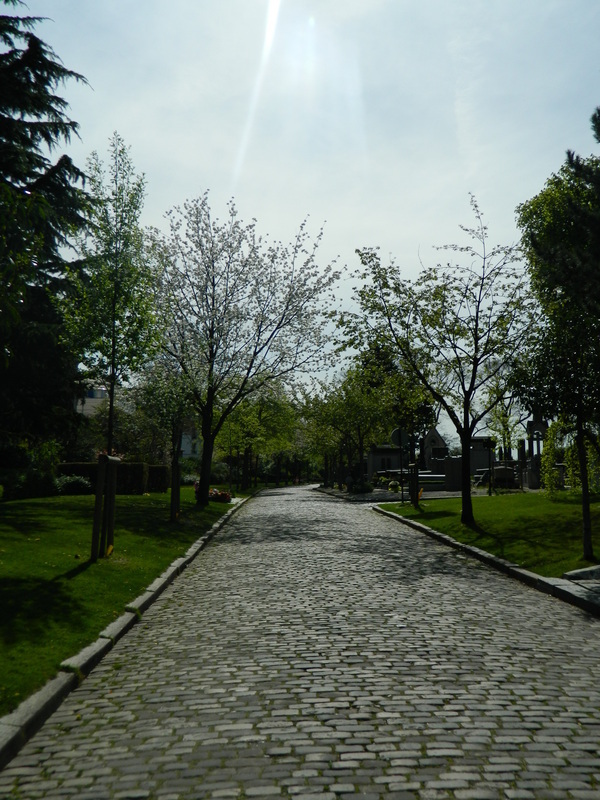 Pere-Lachaise Cemetery is the largest cemetery within the city of Paris, although there are larger ones in the suburbs. What makes it unique, though, is its reputation for having "famous people" buried here, which was an intentional and targeted marketing strategy employed just two years after the cemetery opened, in 1804. 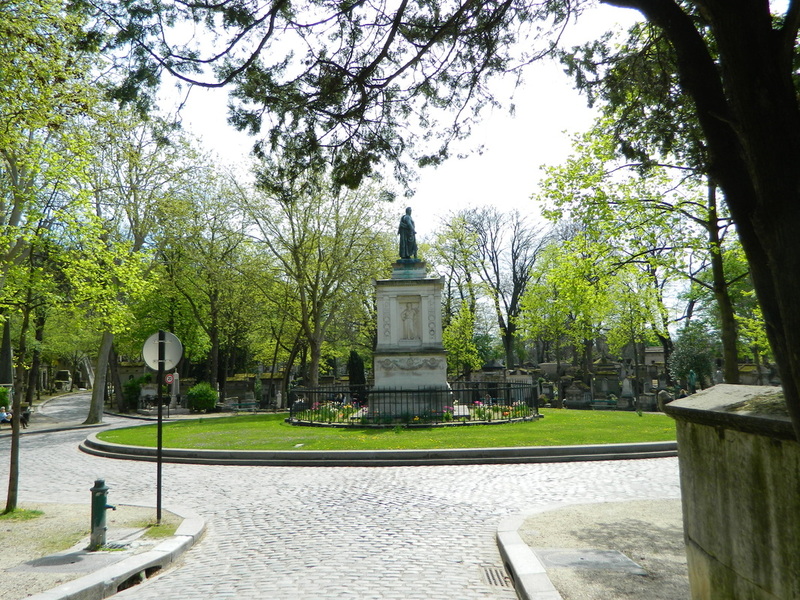 Two years after the cemetery opened, just 13 bodies were buried here, so the administers of the cemetery petitioned to have the remains of Jean de la Fontaine (17th century French poet) and Moliere (French playwright and actor) transferred to Pere-Lachaise. This increased interest in the cemetery and soon people were clamoring to be buried with these famous citizens. 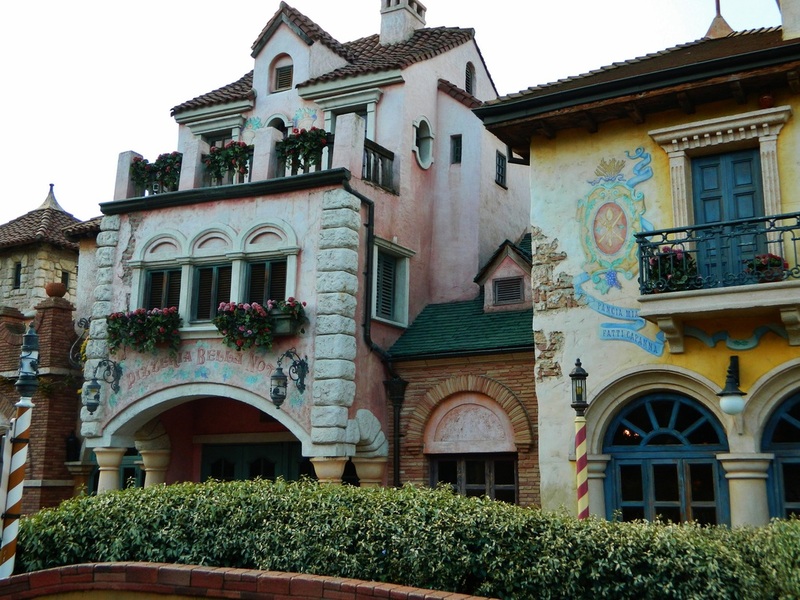 Over the years, it became the final resting place for many writers, poets, musicians, and artists of all kinds. 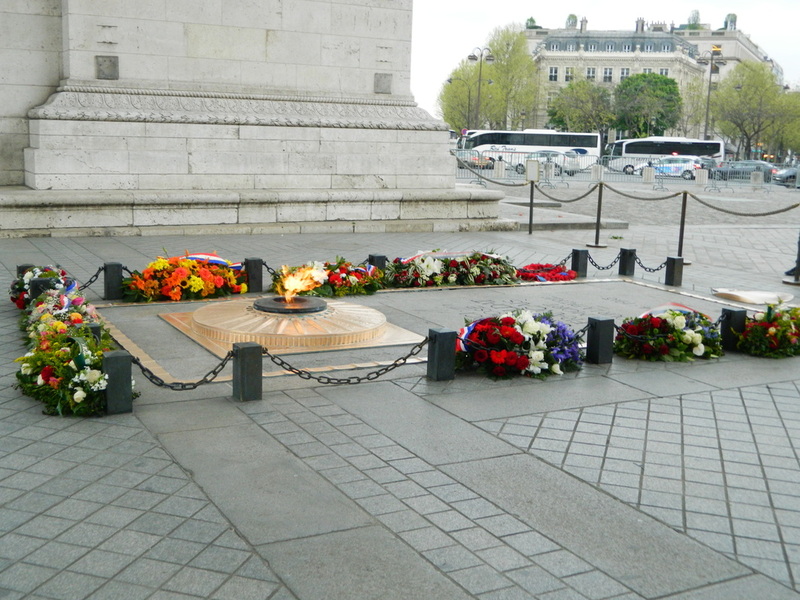 The City of Paris reports that at least one million people are buried here, although the site also contains an ossuary where it is estimated that the bones of 2-3 million people are contained. Ossuarys are used to save space...once a body has decomposed, the bones are removed to make room in the tomb/grave for a new body, and the bones are stored separately. Recently the ossuary became over crowded, so many bones were removed for cremation, then returned to the site for more compact storage. Despite its morbidity, this cemetery is a most peaceful and beautiful place to take a walk. 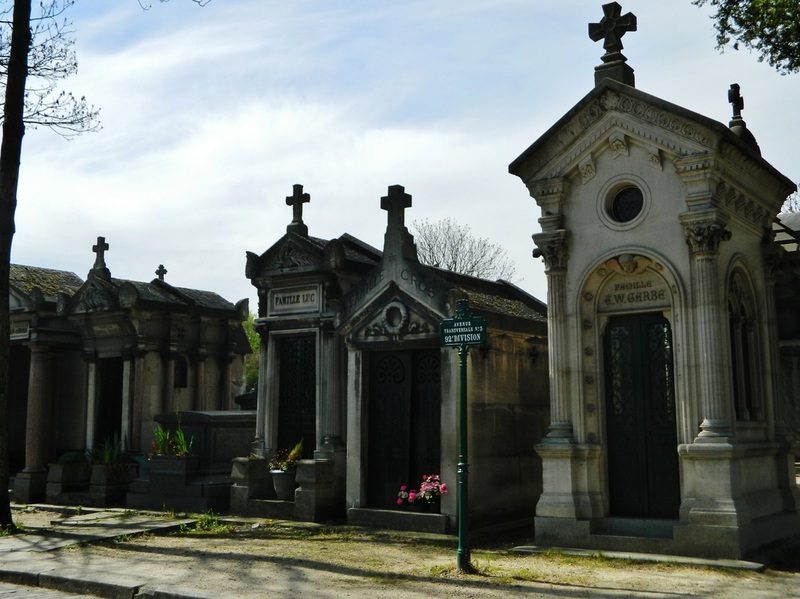 It is still an active cemetery today, but the rules are strict--people are dying to get in (ha) but they have to die in the city of Paris or be living in Paris to qualify, and there is a substantial waiting list. Pere-Lachaise has graves of all kinds from simple headstones to very elaborate tombs, many about the size and shape of a telephone booth. They have doors, and a small place inside to kneel and pray. It reminded me of a subdivision neighborhood with some "houses" neat as a pin, well-maintained, even remodeled, but others literally crumbling apart. In many cases there are graves on top of graves on top of graves, and entire families buried together in one tomb. When families stop paying the lease on the space, remains are moved to the ossuary to make room for a new grave. 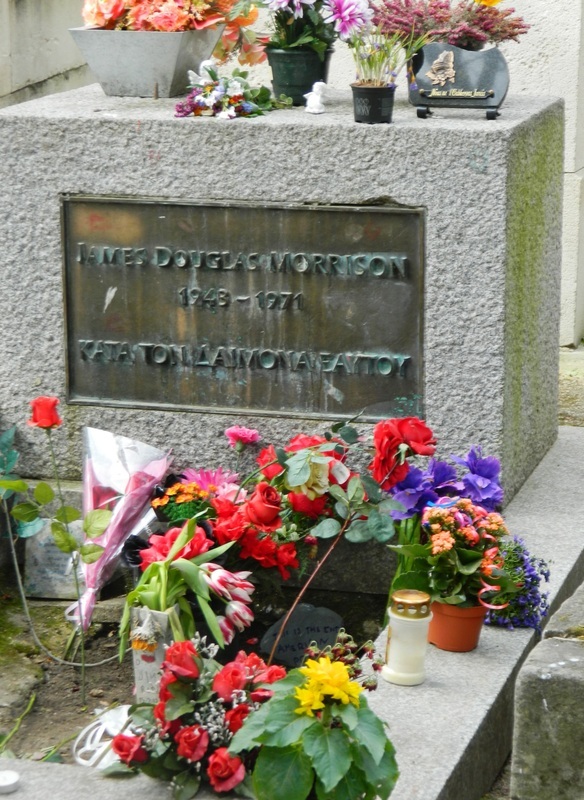 Among the famous artsy people who are buried at Pere-Lachaise are Oscar Wilde and Jim Morrison (The Doors). 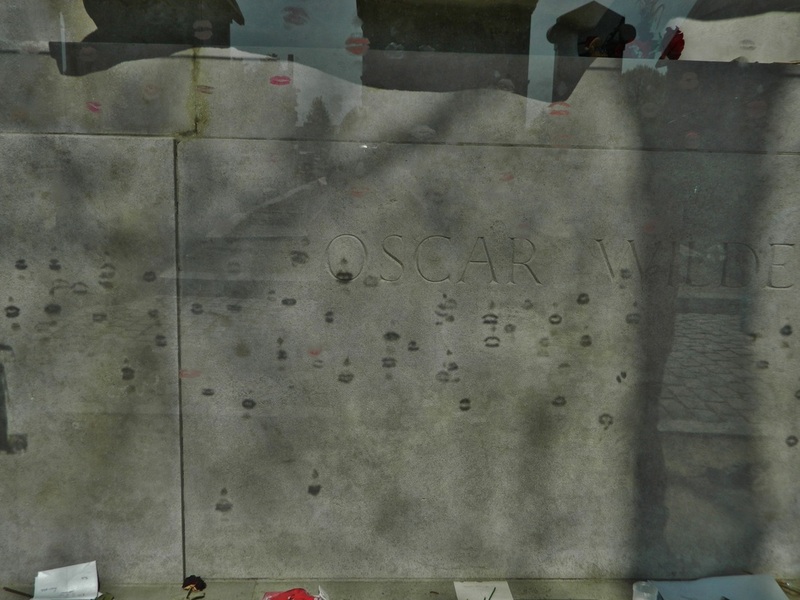 About three years ago, Oscar Wilde's monument had to be encased in glass because starting sometime in the 1990's, kissing his monument became sort of a cult pastime for Paris tourists. So many lipsticked-laden people were kissing the stone, the monument was deteriorating from the cleaning agents needed to remove all of the grease. 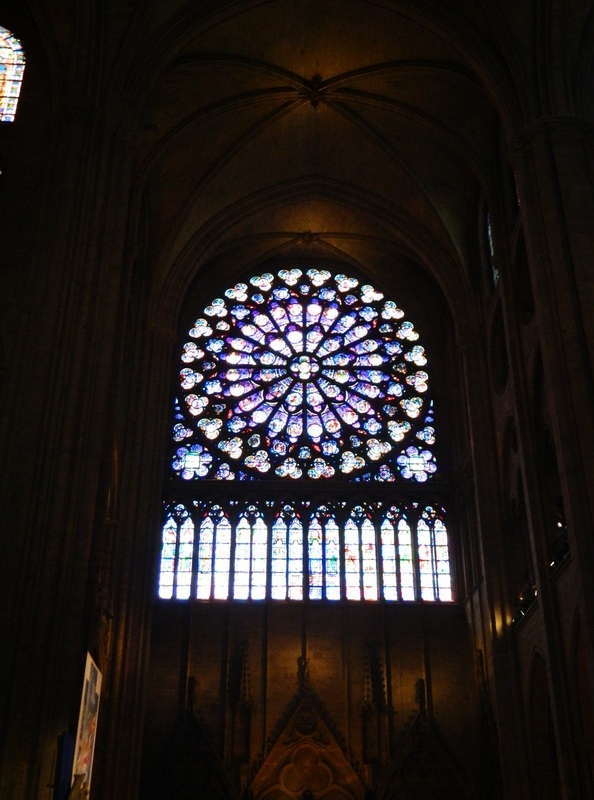 As you can see from the picture below, now people have taken to kissing the glass instead. For the record, I did not kiss the glass, nor did I want to. :) I have, however, kissed the Blarney stone, which now that I think about it, seems a little gross. Oscar Wilde's grave, encased in glass. The sun highlights the many kisses this tomb still gets every day...there is a 9,000 euro fine for anyone caught planting one on it, but because most of the "kissers" are tourists, they are usually long gone by the time the French could bring them to court. 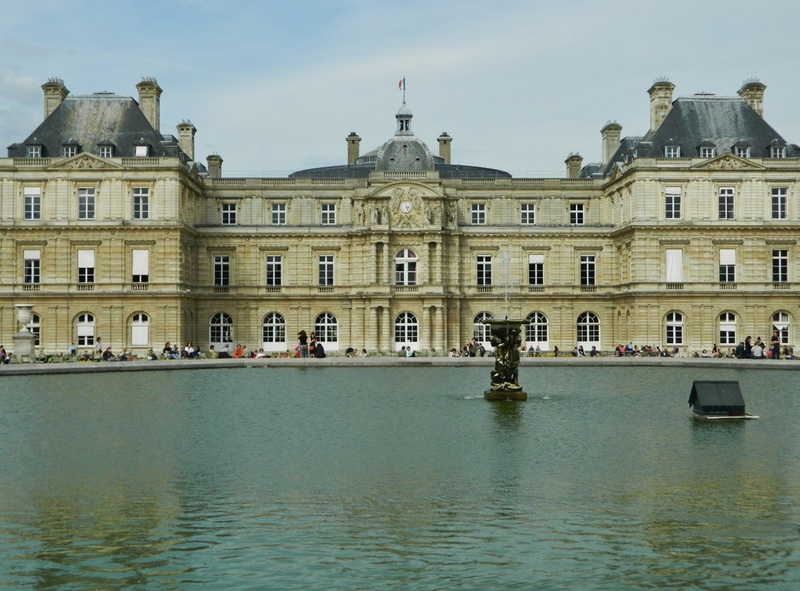 From Le Bon Marche, we headed over to the Jardin du Luxembourg, one of the most popular parks in Paris. 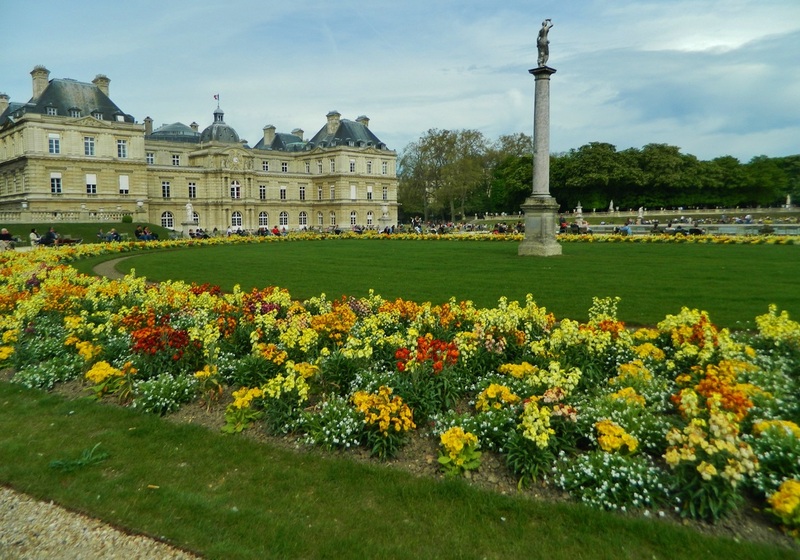 The Jardin du Luxembourg surrounds the Palais du Luxembourg (Luxembourg Palace) which is currently the seat of the French Senate. 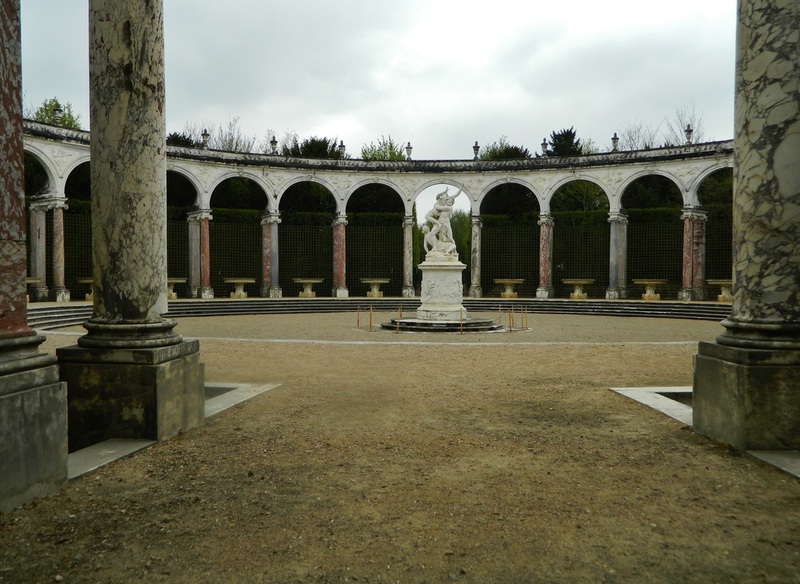 The Palace has a long and interesting history, but we opted to stay outside and just enjoy the gardens instead! 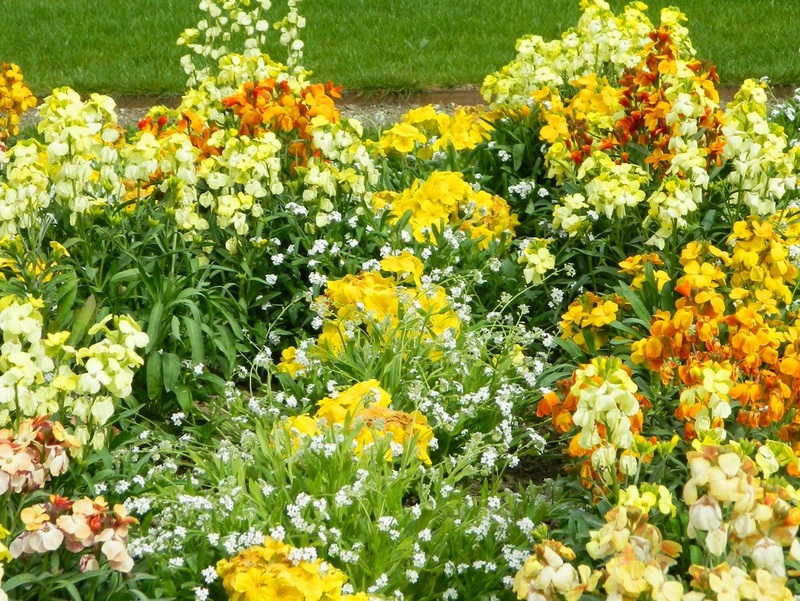 This park has a large play area, tennis courts, large ponds and toy boats to rent to float in the ponds, an orchard, pony rides, paths, flowerbeds, fountains, and lots of chairs all around the park to just sit down and relax. The park is popular with students who come here to study, chess players who enjoy a game outside, and of course, plenty of tourists. 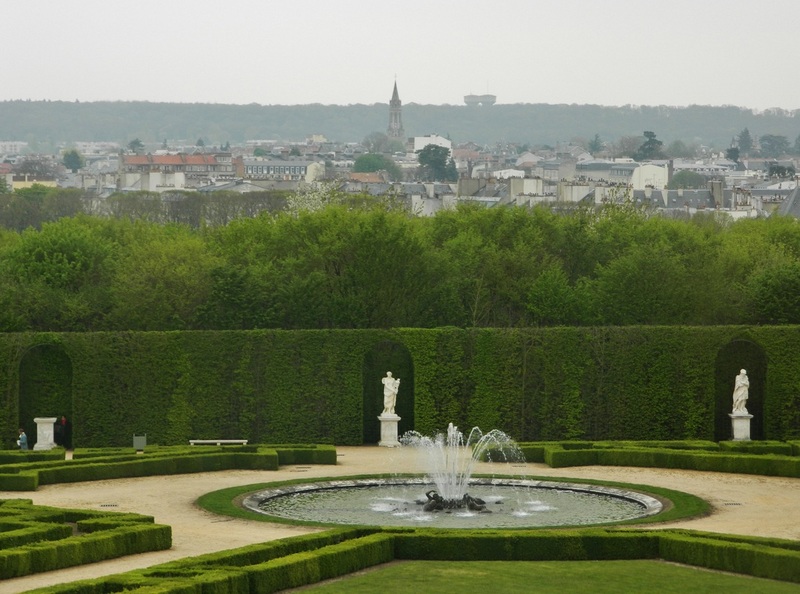 Val d'Europe is part of a planned community called Marne-de-Vallee, about 35 km east of Paris that was built in conjunction with The Walt Disney Company who wanted to create a town near Disneyland Paris. 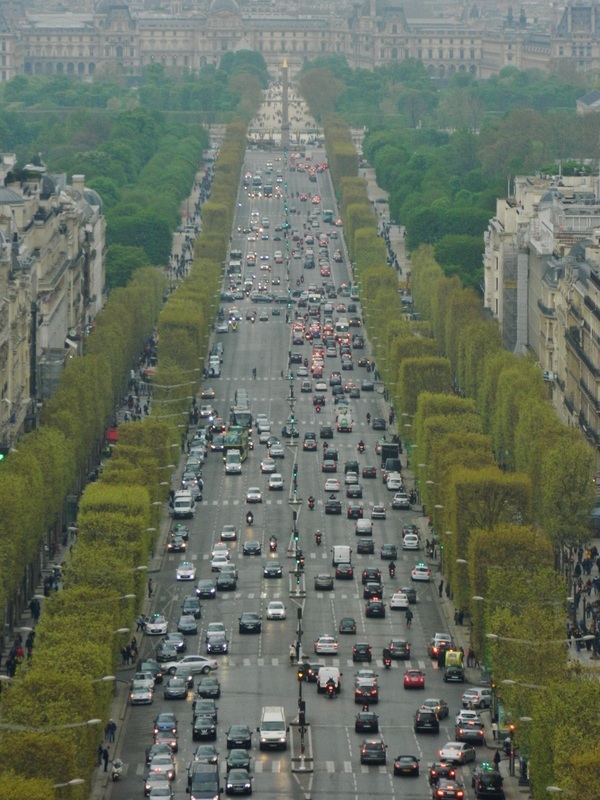 Val d'Europe is a modern shopping mecca with a huge mall and outdoor designer outlet complex. 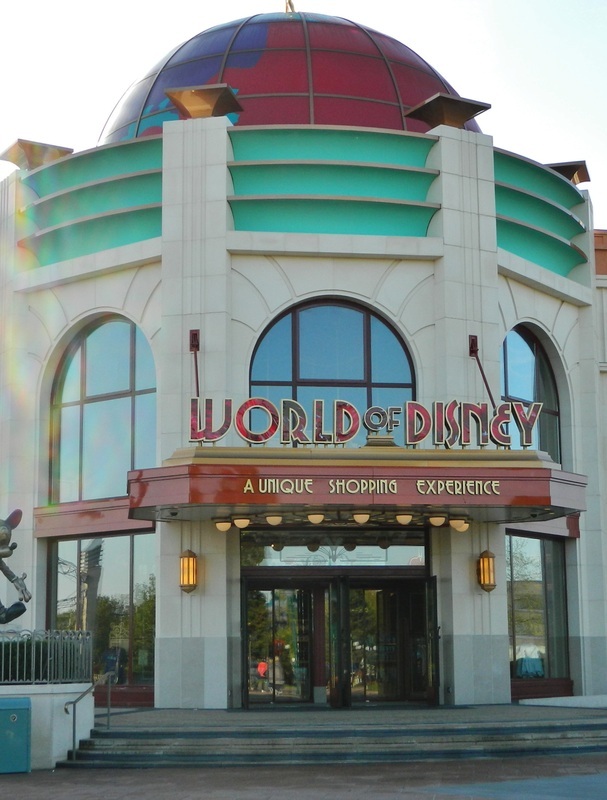 The mall contains numerous restaurants, an aquarium, and a well-developed transportation system to take you to...Disneyland! 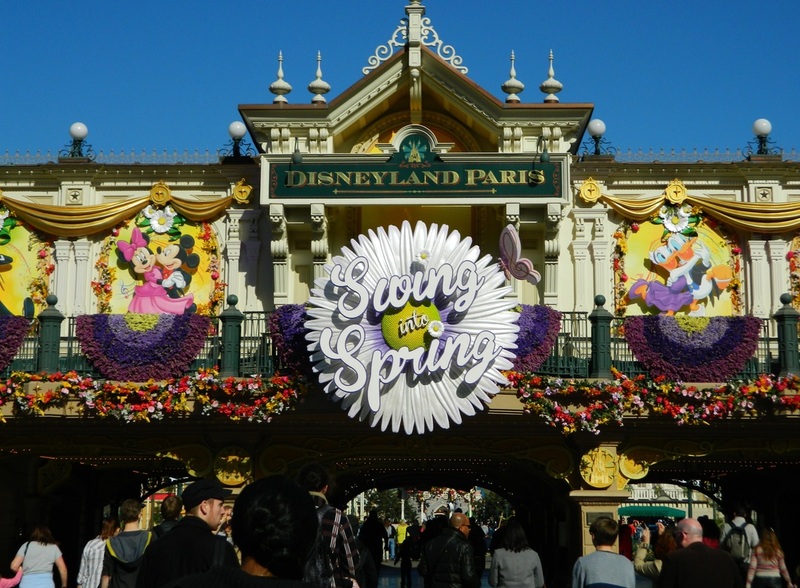 We spent a recovery day here before forging on to the Happiest Place on Earth. 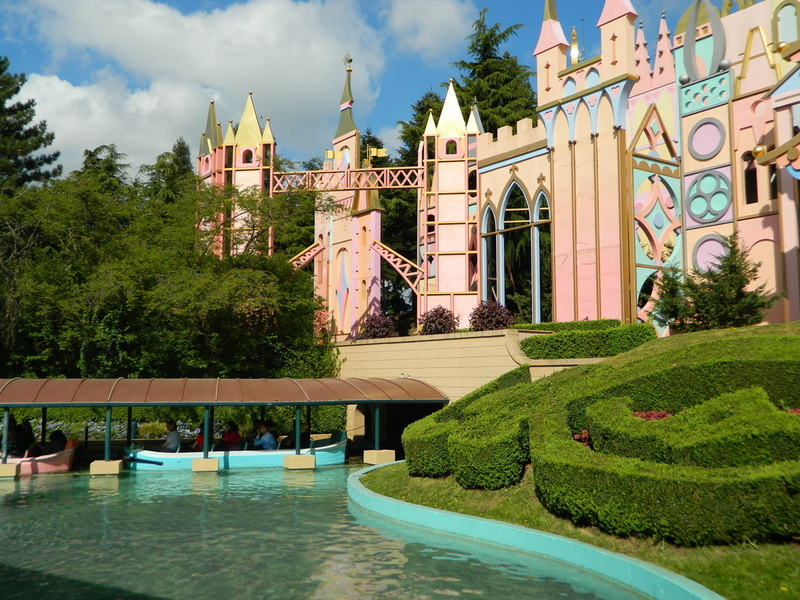 If you've been to Disney in the US, you will find Disneyland Paris to have some of the same elements and rides but with mostly different names. 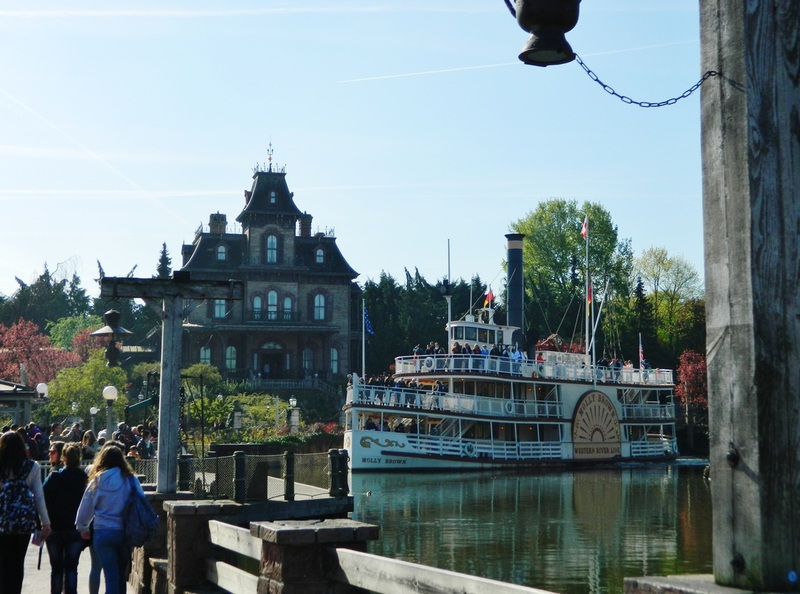 The Haunted Mansion is called Phantom Manor, the Mark Twain is called the Molly Brown, etc. 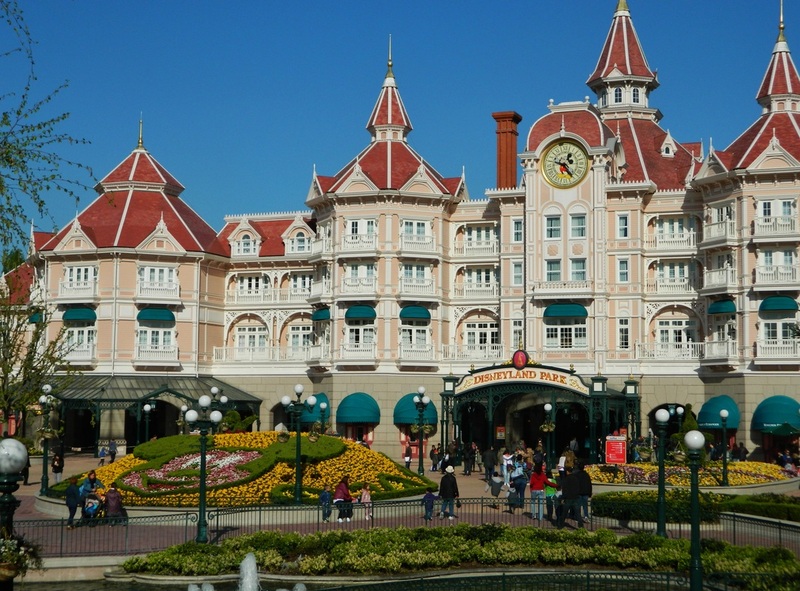 Disneyland Paris is divided into two parks, albeit much smaller than what you might expect. 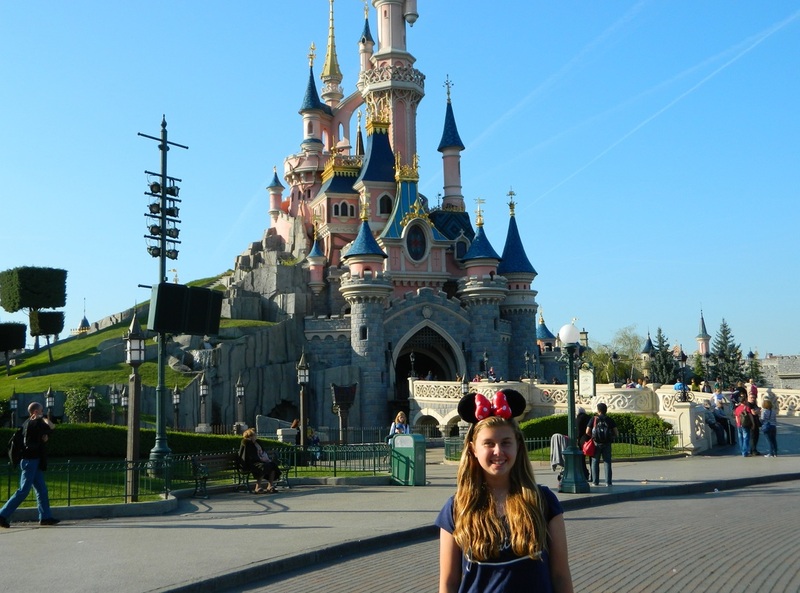 There is Disneyland Park, and Walt Disney Studios, and Disney Village in between (shopping & restaurants). The grounds are beautiful, and I liked that it was easy for us to get around to everything we wanted to see in just one day. 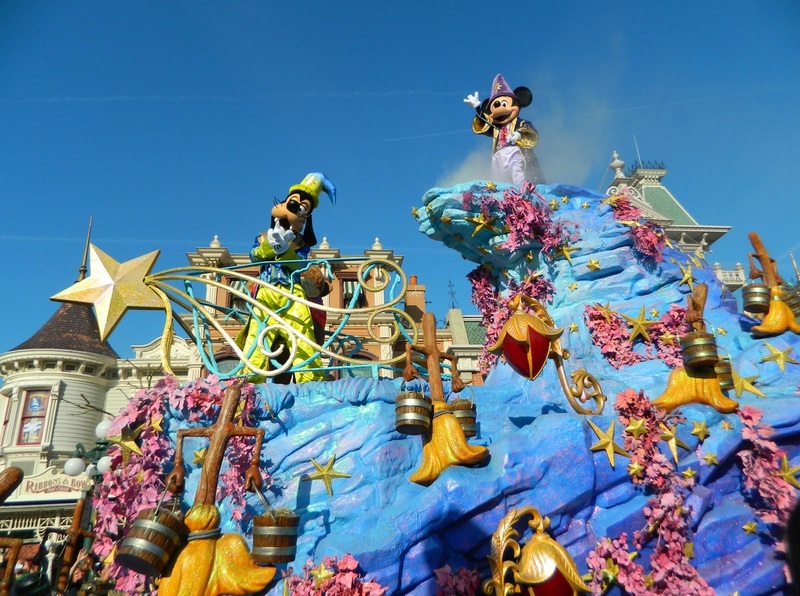 True to form, though, Disney is all about marketing, marketing, marketing! There is merchandise everywhere, and it's all expensive. So is the food. 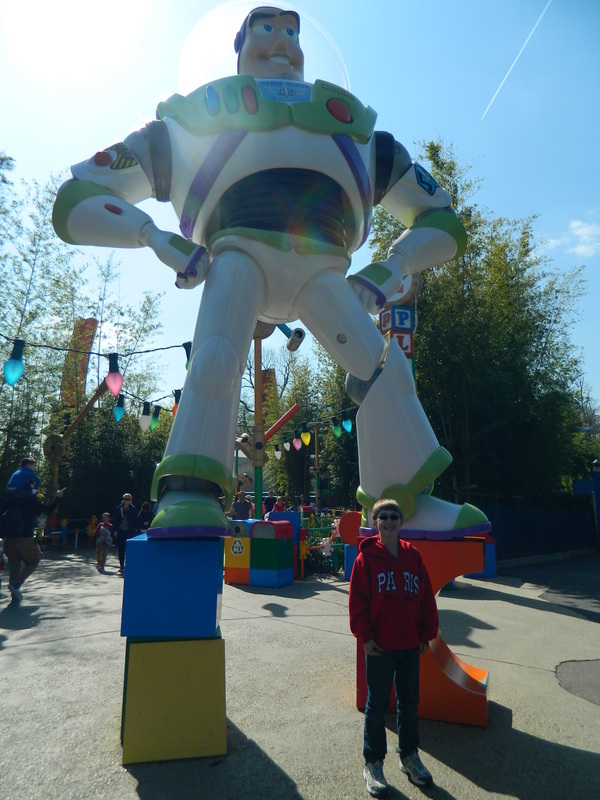 But, for us this was a once-in-a-lifetime experience and it was worth every penny! Disneyland Paris does a nightly event just before closing (9:30PM) which is a combination of fireworks, and a lighted projection show on the castle. 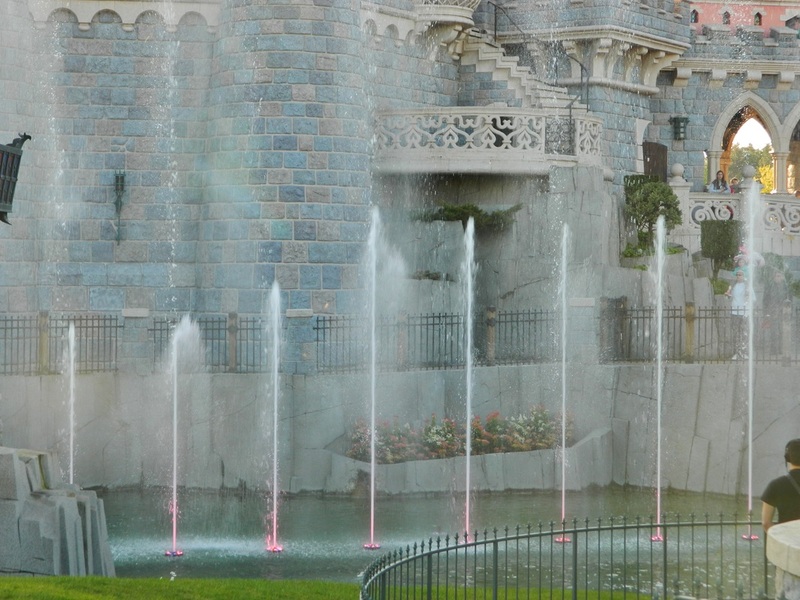 The show is "interactive" in that it is integrated with the light-up Mickey ears that you'll see vendors selling at dusk, so when the lights in the show change, peoples ears light up to match...I don't know how they do it, but those Disney guys are pretty clever! I hope you find yourselves with an opportunity to visit Paris someday, and if you do, I'd love to hear all about your trip! Buen viaje!